Maruoka castle (丸岡城) is located on a small hill named Maruoka at the center of former Maruoka town, now merged into Sakai city at the northeast area of Fukui prefecture. 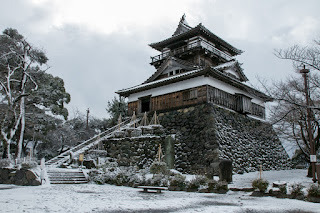 Maruoka castle is located at the opposite of Kuzuryugawa river from Fukui city, the center of Echizen country (Fukui prefecture). 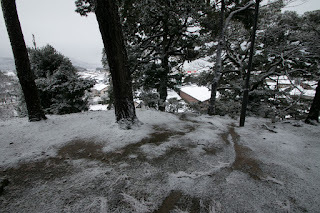 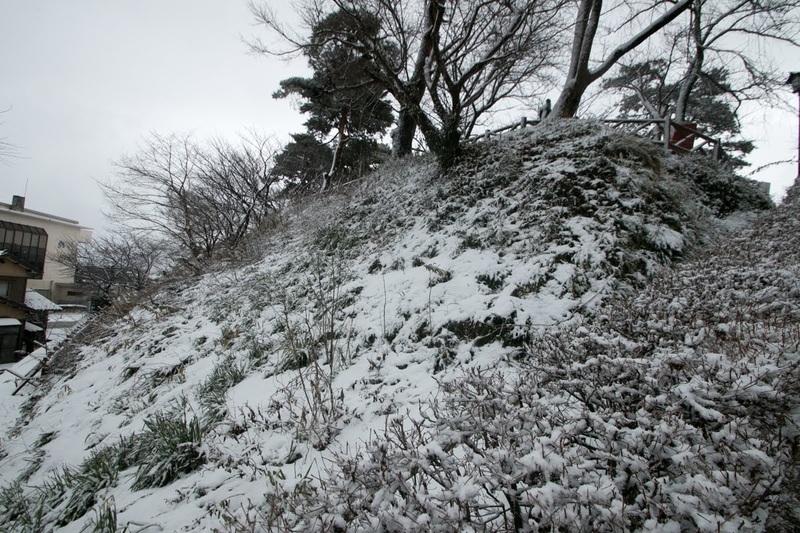 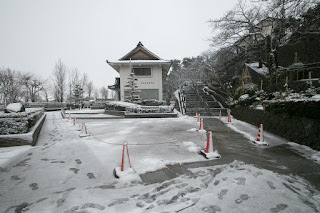 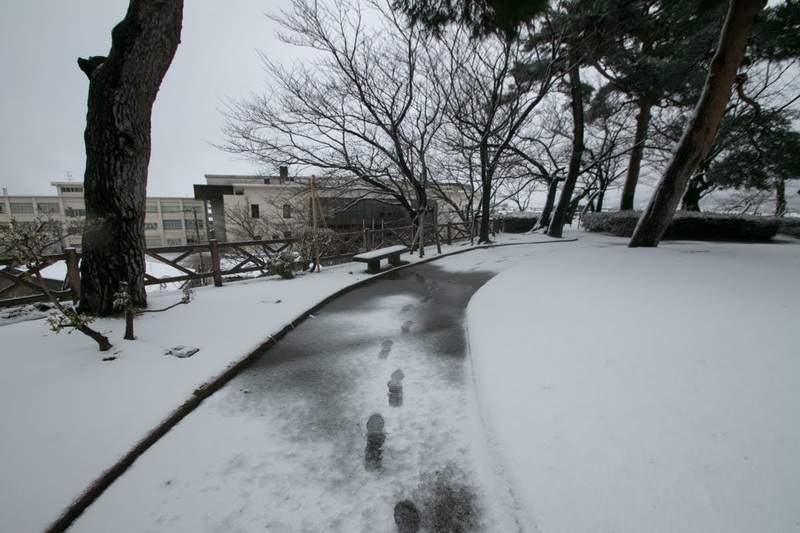 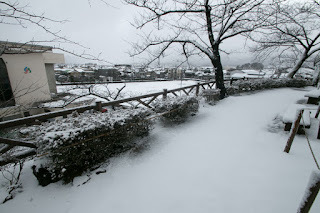 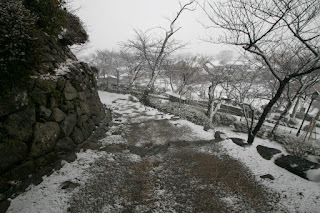 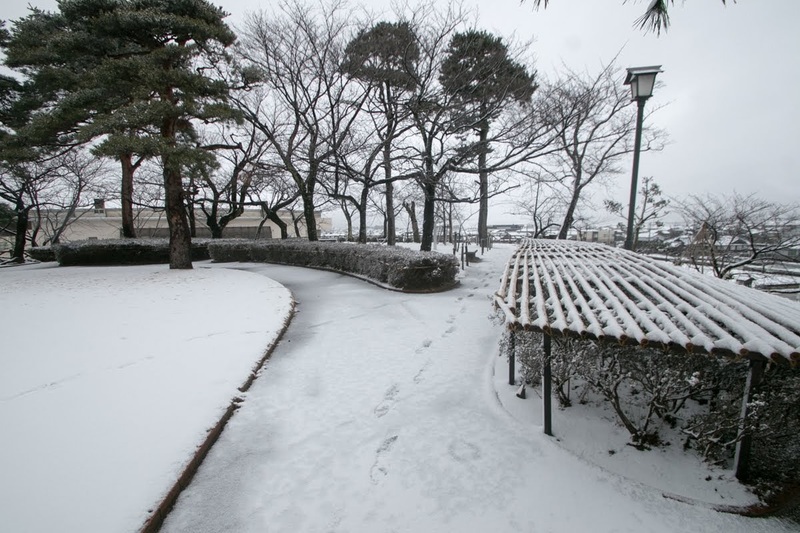 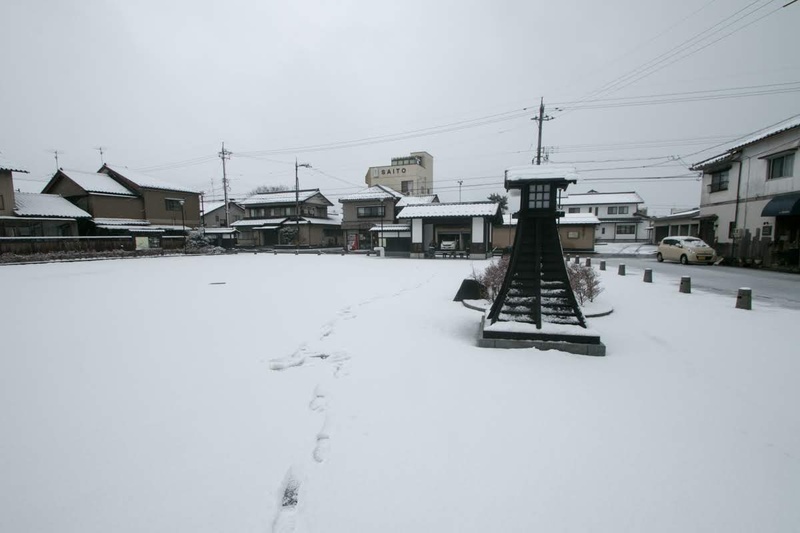 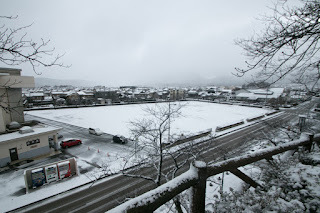 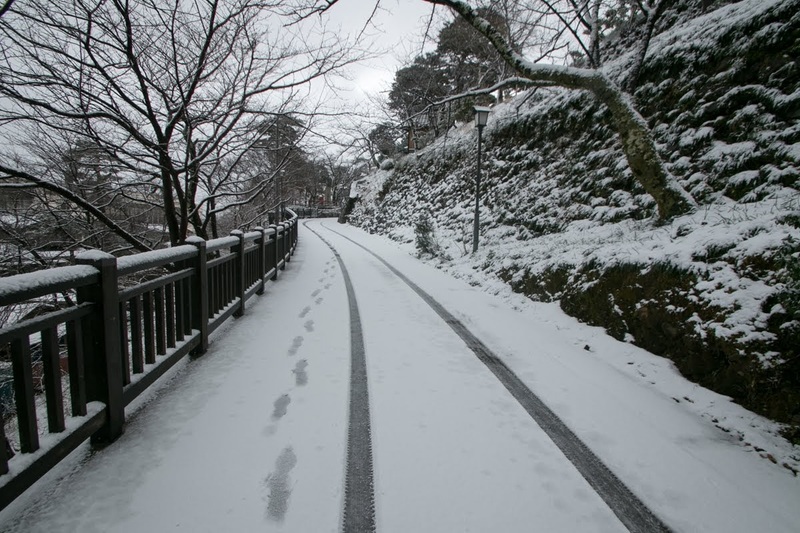 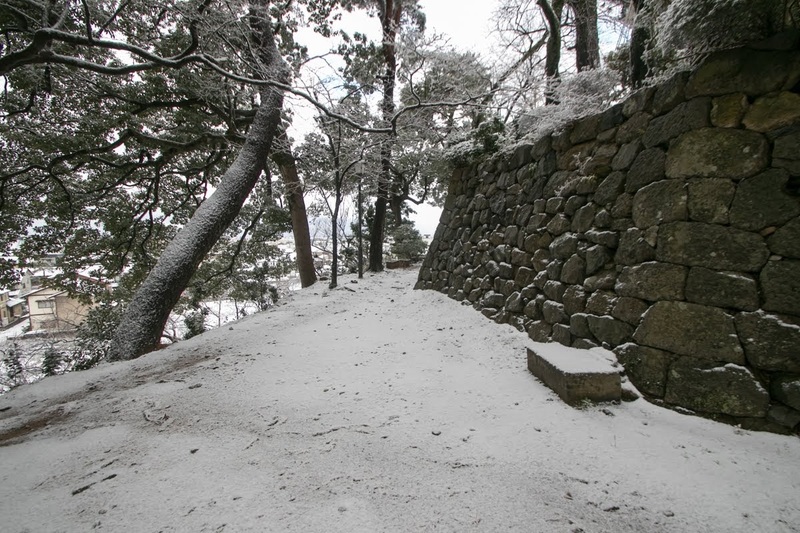 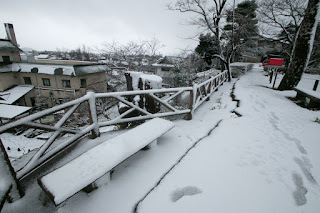 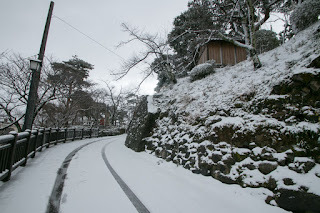 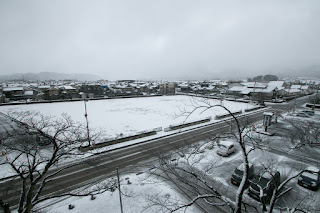 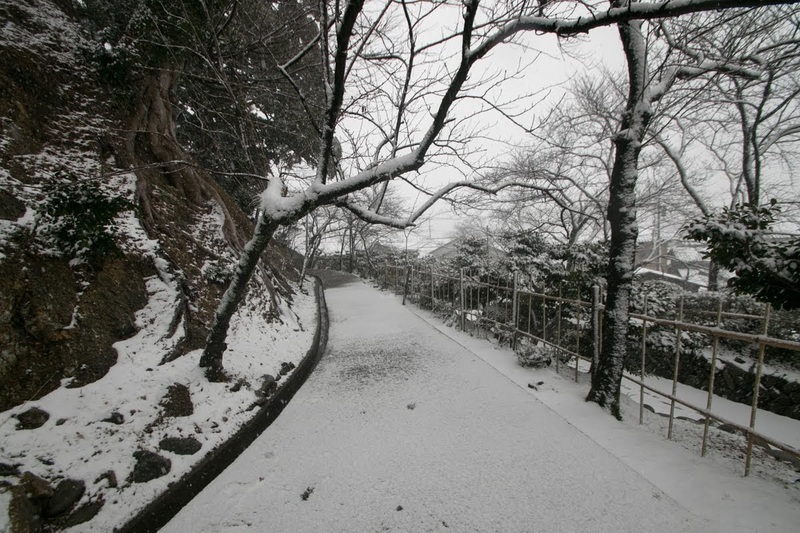 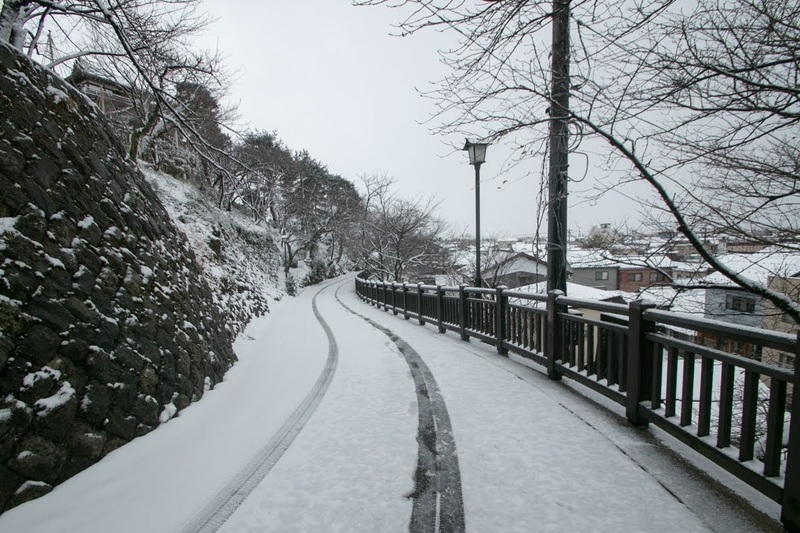 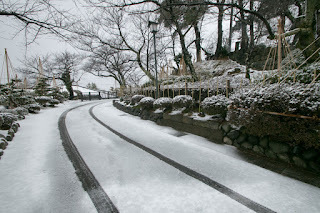 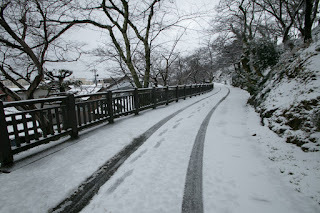 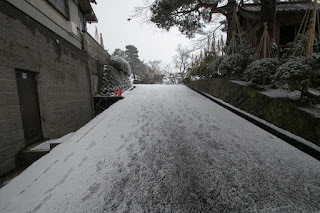 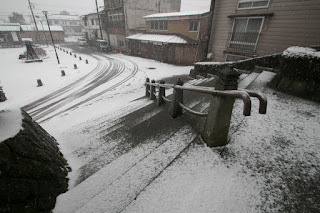 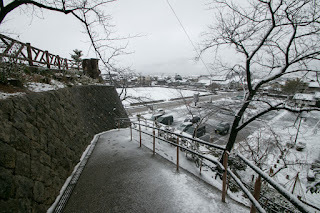 As a control point of Hokurikudo way from Kaga province (Ishikawa prefecture) and Mino Kaido road from Mino province (Gifu prefecture), the place of Maruoka castle was an important point as forefront. 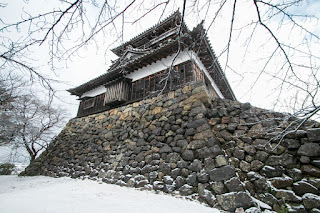 Maruoka castle was built by Katsutoyo Shibata (1556-1583) in 1576. 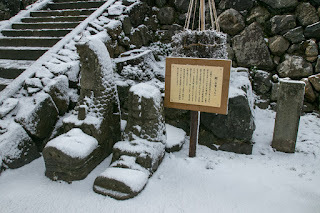 In the previous year, Nobunaga Oda (1534-1582), a warlord of Owari province (Aichi prefecture) and central ruler, thoroughly extinguished Ikko Ikki army, a large scale rising of people united under Jyodo Shinshu, a denomination of Japanese Buddhism, which dominated Echizen province after extinction of former governor Asakura clan. 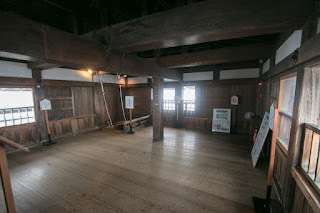 Nobunaga placed his veteran general Katsuie Shibata (1521-1583), as a general commander of this region at Kitanosho castle. 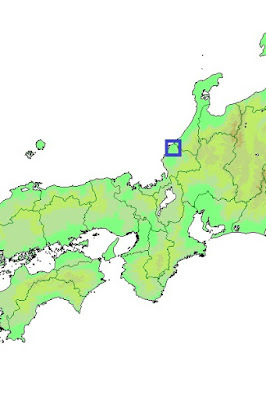 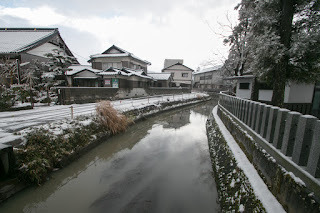 Katsuie appointed his nephew Katsutoyo Shibara (?-1583) as a governor of this region. At first Katsutoyo restored Toyohara castle formerly used by Ikko Ikki army, but it was inconvenient castle located in deep mountain, thus Katsutoyo decided to build a new castle in the plain area. 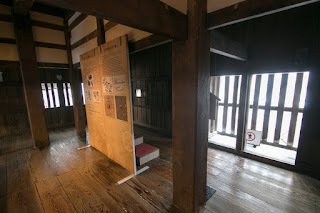 Generals of Katsuie Shibata kept Maruoka castle by 1583, but this year Katsuie was defeated by Hideyoshi Toyotomi (1537-1598) at the battle of Shizugatake and killed himself at Kitanosho castle. 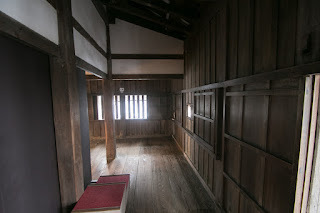 Under Toyotomi government Aoyama clan served as a commander. 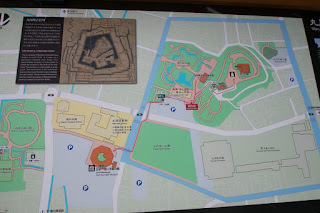 In 1600, after the death of Hideyoshi, battle of Sekigahara arouse between Ieyasu Tokugawa (1543-1616), the largest lord under Toyotomi government and Mitsunari Ishiada (1560-1600), the chief administrative staff of Toyotomi government, and Ieyasu won. 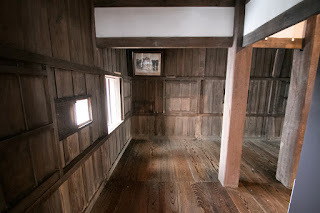 Ieyasu placed his second son Hideyasu Yuki (1574-1607, adopted to Yuki clan), at Echizen country as a restraint to Maeda clan, the largest lord under Edo shogunate held current Ishikawa and Toyama prefecture. 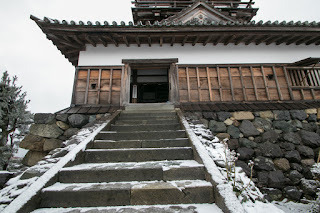 Maruoka castle was given to Hideyasu’s vassal Moritsugu Imamura, and next changed to Narishige Honda (1572-1647) in 1612. In 1623, Yuki clan was demoted under the pretext of mesbehavior of leader, and Narishige became the independent lord of this castle. 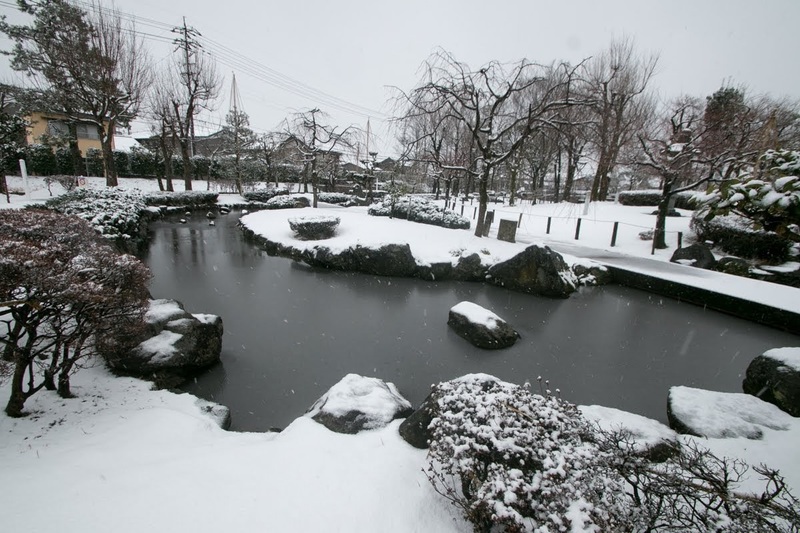 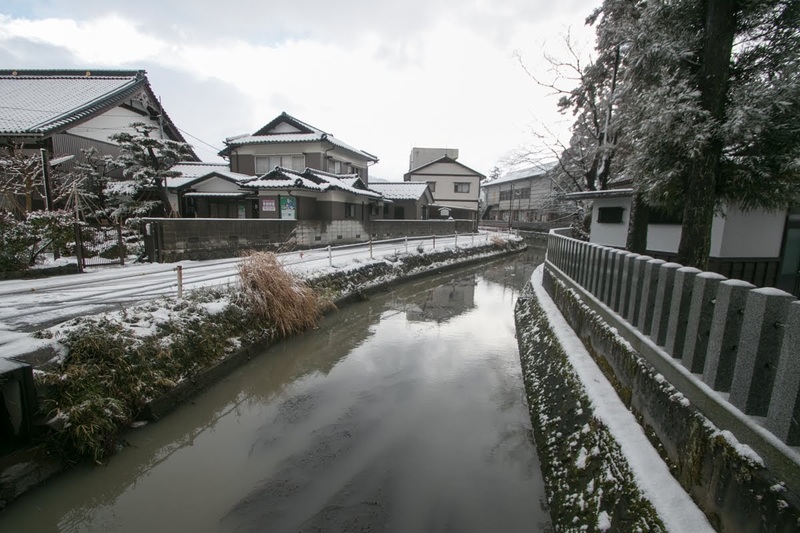 On this occasion, Narishige expanded Maruoka castle surrounded by stone walls and large water moats, and also improved castle town as a residence of feudal lord. 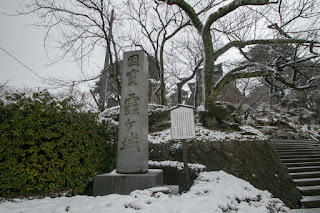 Narishige Honda was a son of Shigetsugu Honda (1529-1596, called as Sakuzaemon). 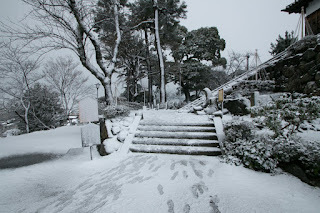 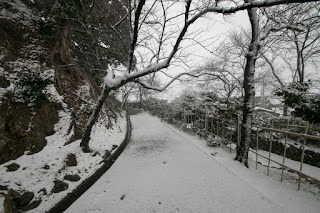 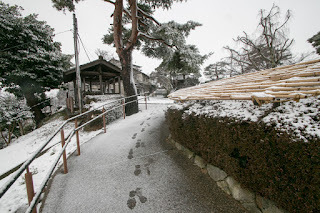 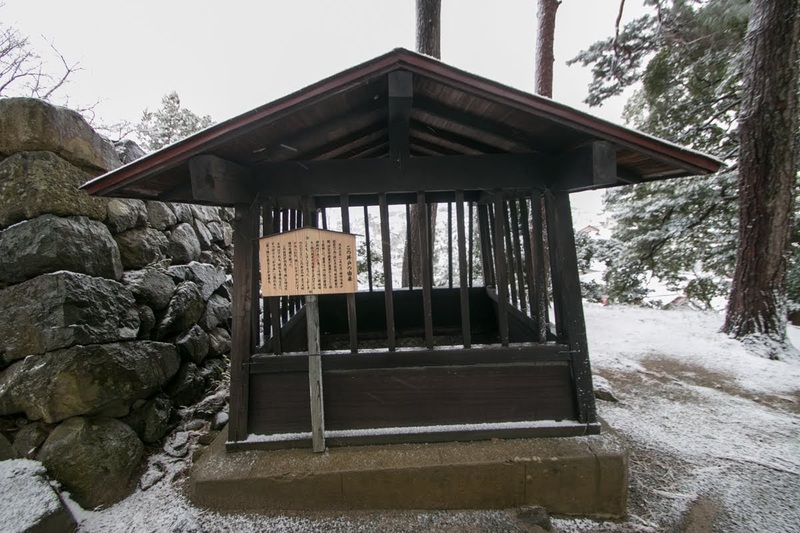 Shigetsugu was a old retainer of Ieyasu Tokugawa served over 40 years. He was known for writing the shortest letter in Japan to his family when he attended the battle of Nagashino in 1575. The contents of the letter was “ I wish to state respectfully that please pay attention to fire of the house, growth of son (later Nagashige) and feeding of horses”. 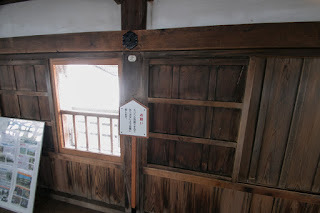 In Japanese letter we use many designated rhetoric, thus this latter evoked intention of people, and Maruoka town hold the contest of short letters commemorating him every year. 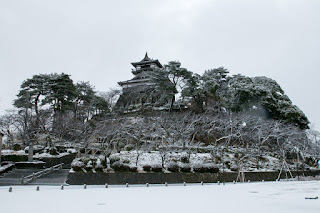 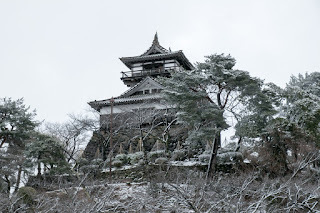 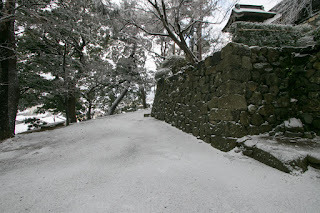 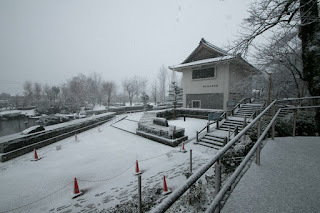 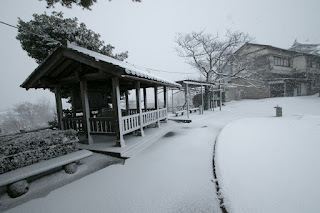 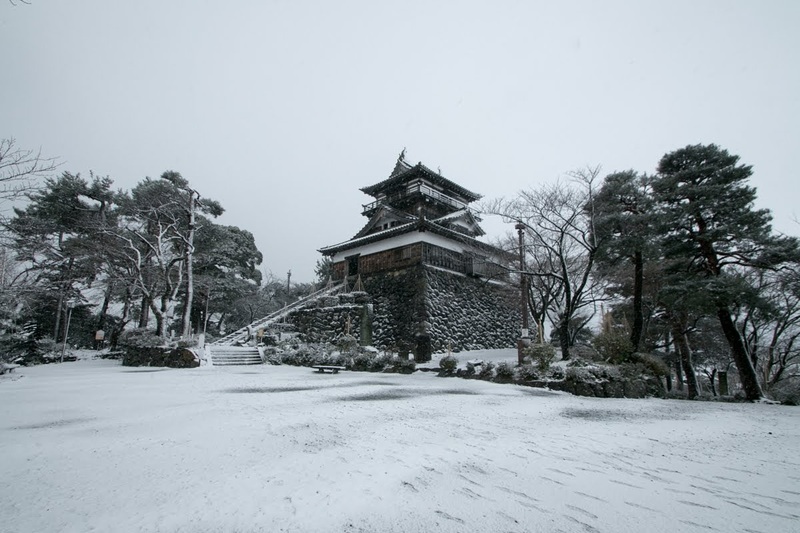 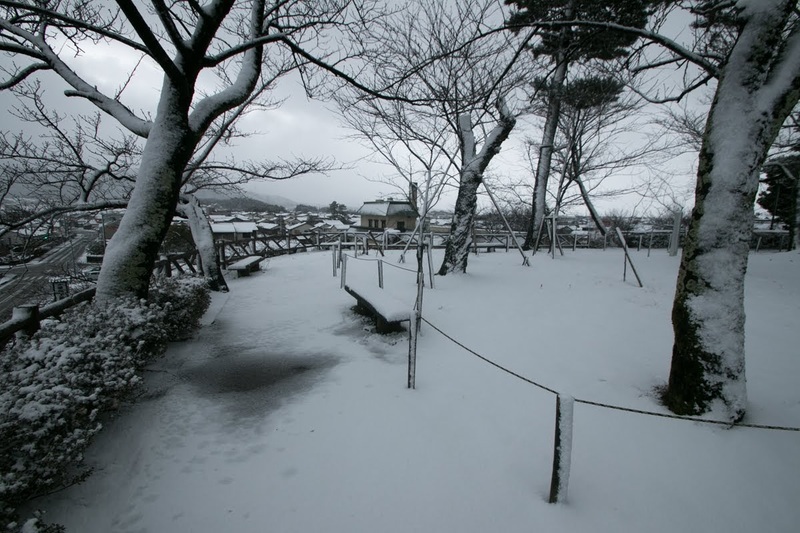 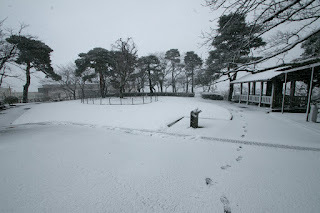 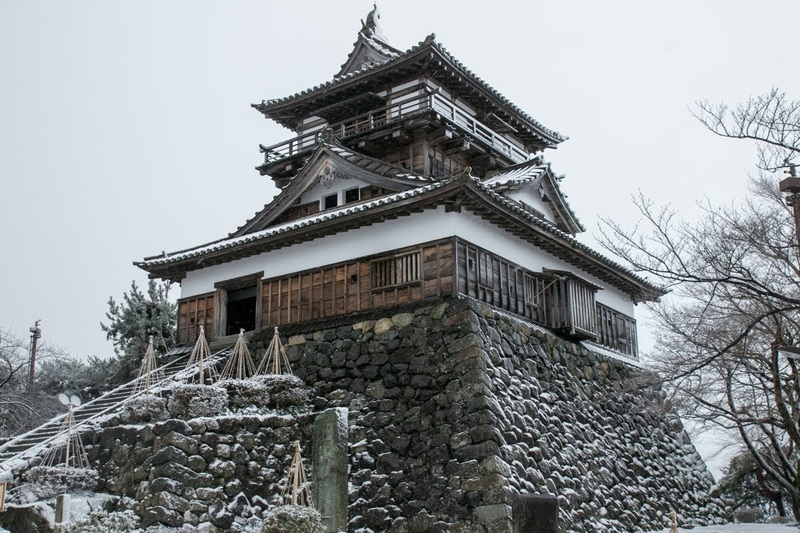 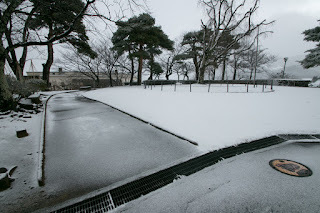 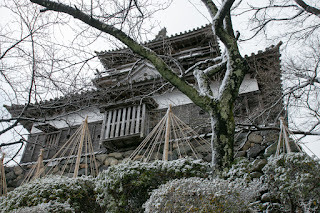 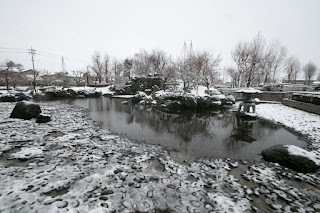 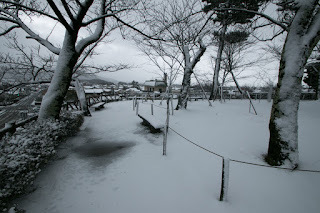 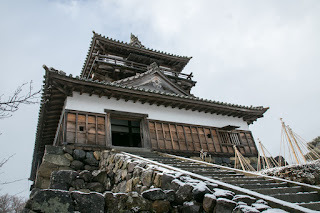 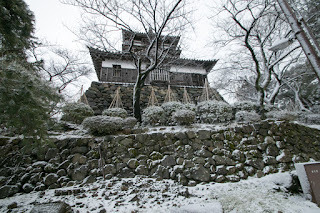 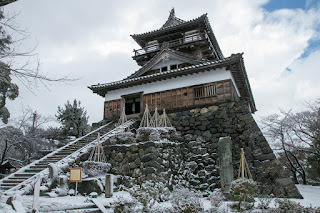 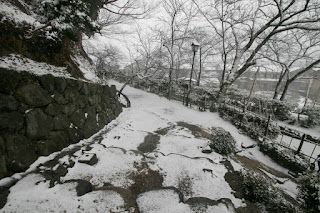 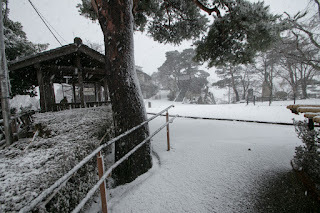 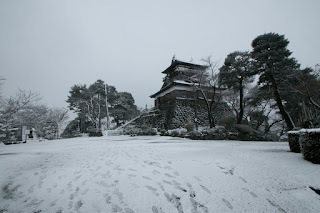 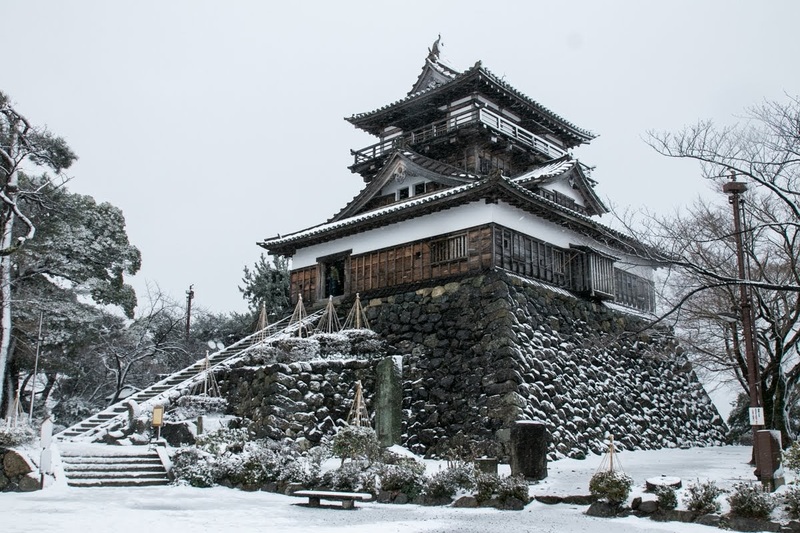 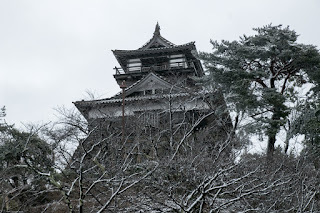 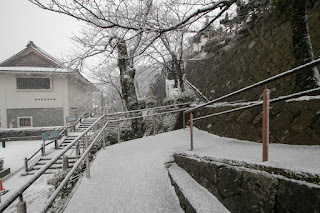 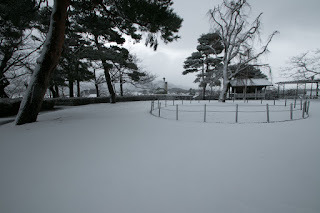 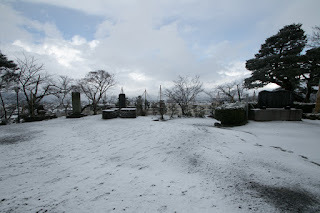 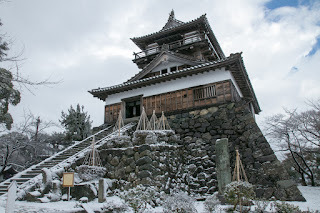 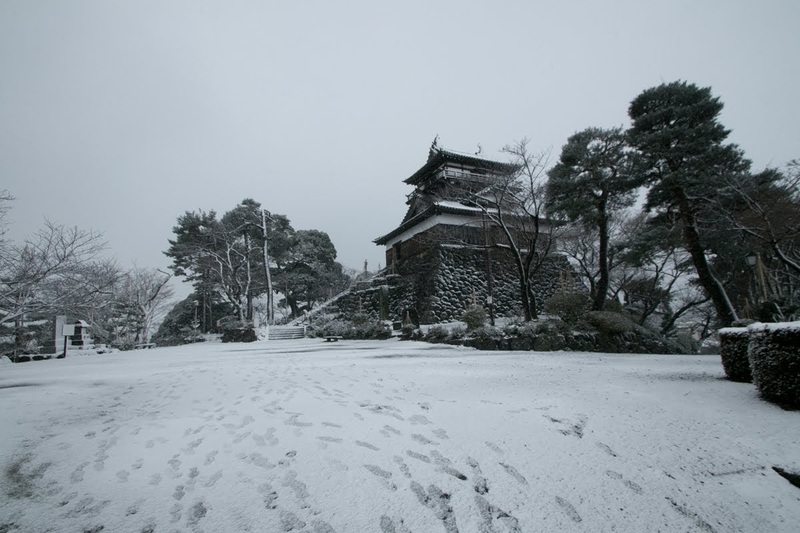 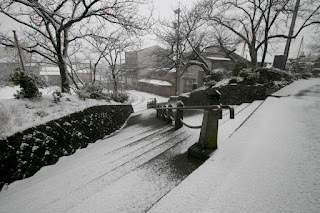 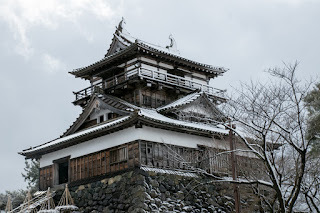 Maruoka castle is one of 12 castles which have original main tower (Tensyukaku /Tenshukaku) in Japan. 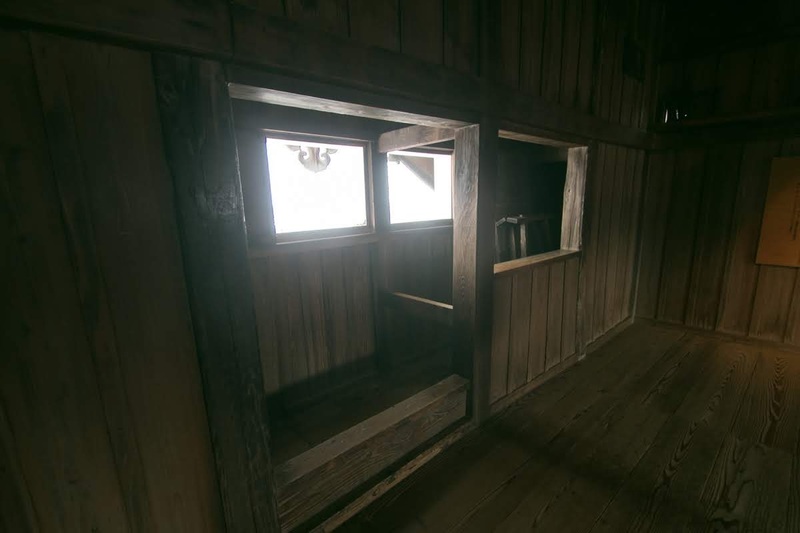 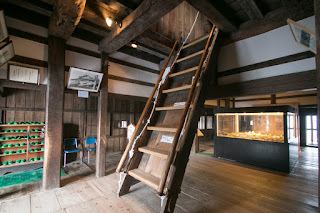 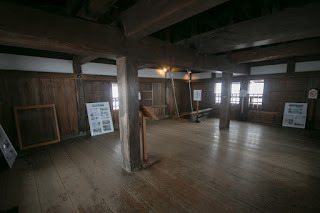 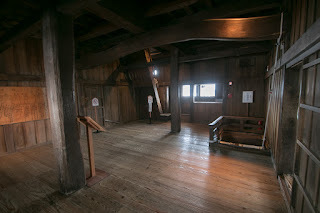 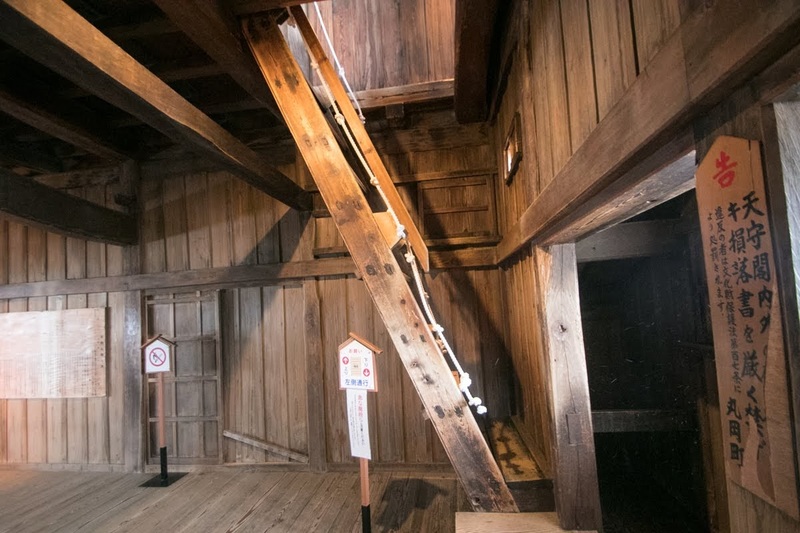 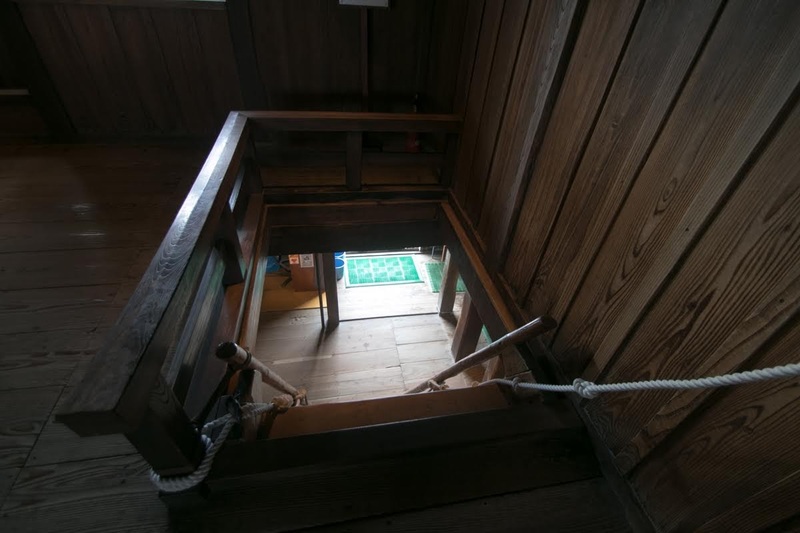 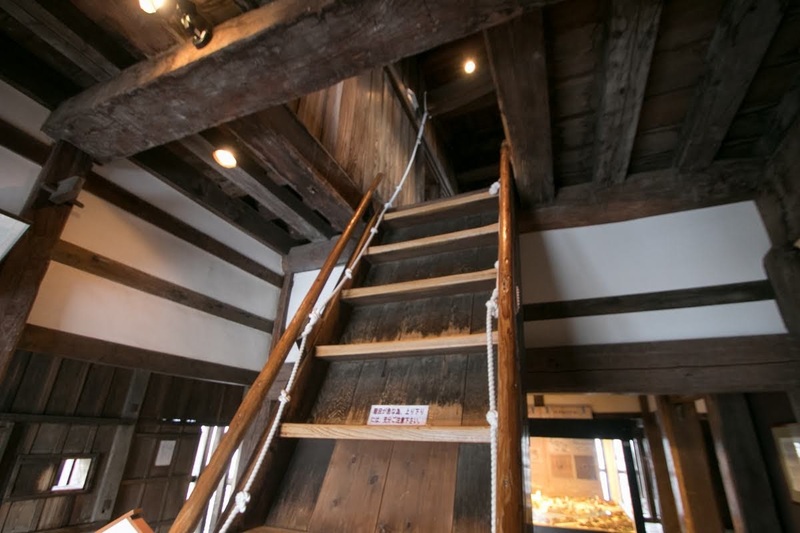 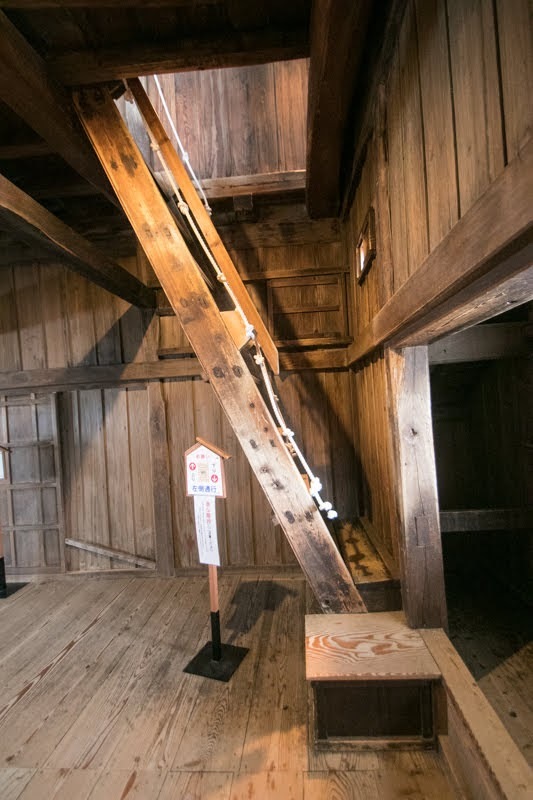 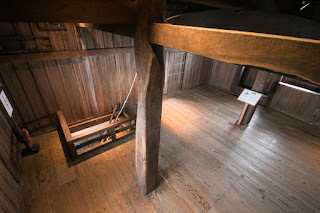 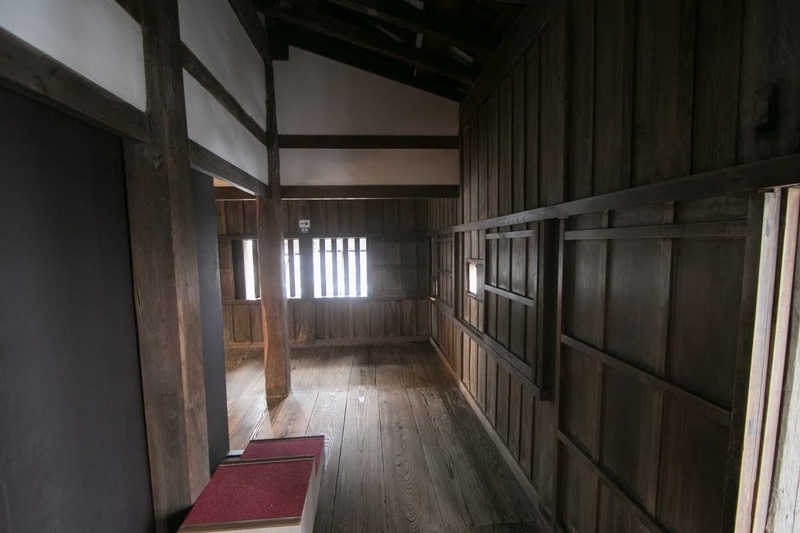 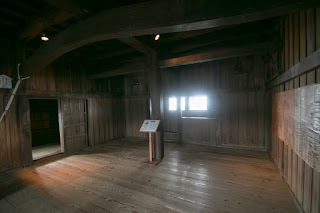 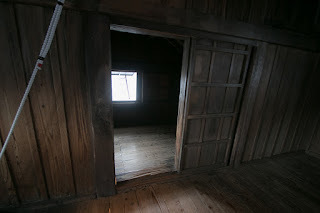 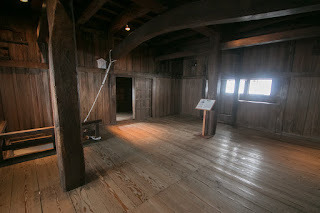 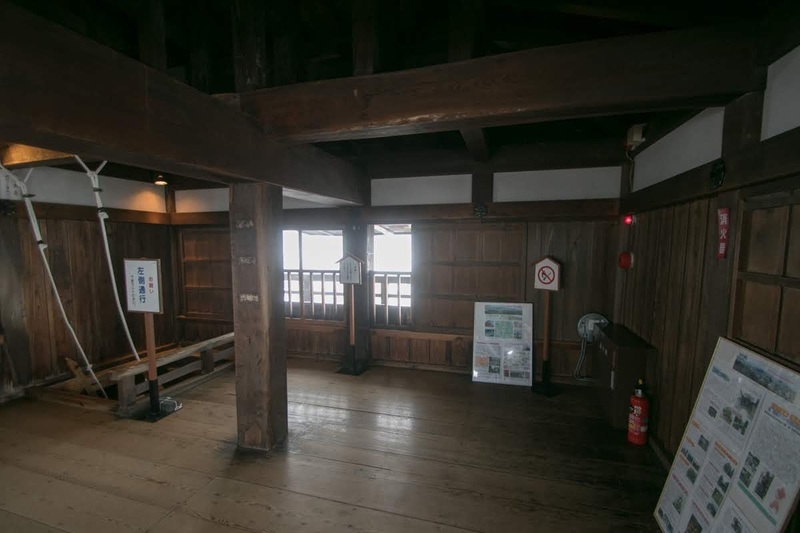 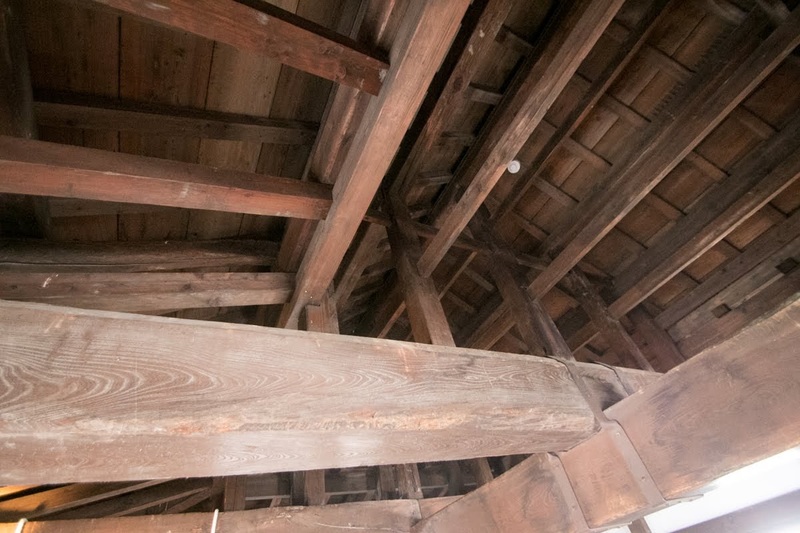 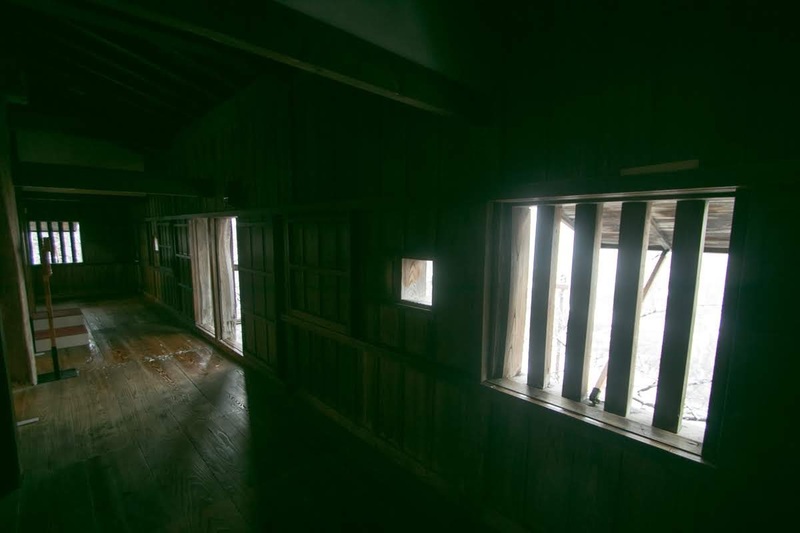 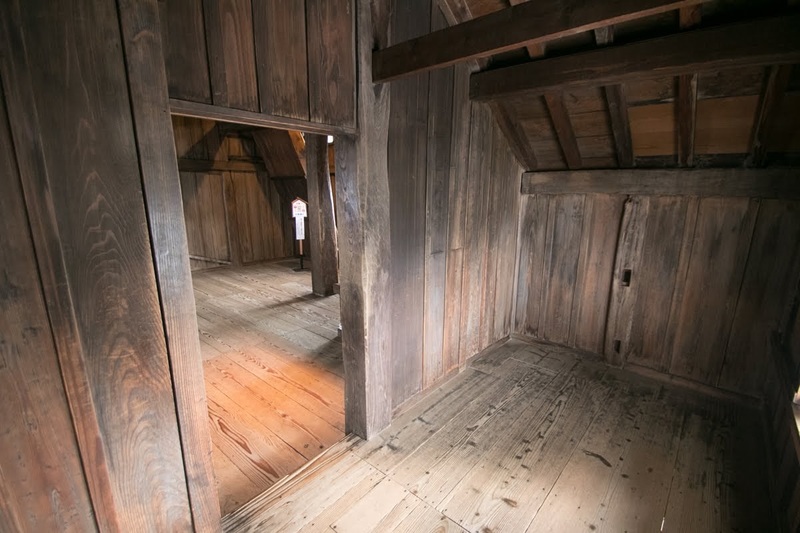 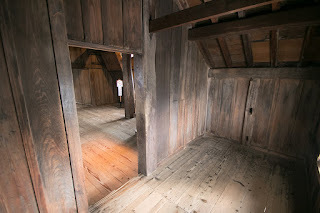 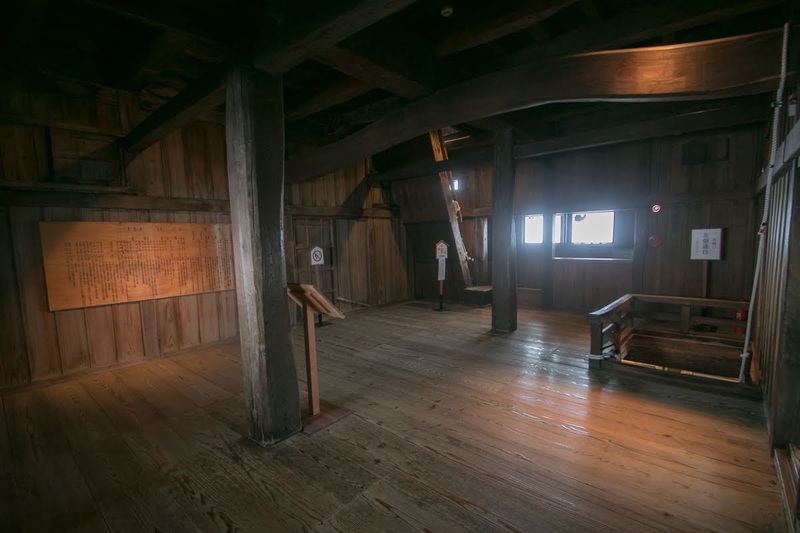 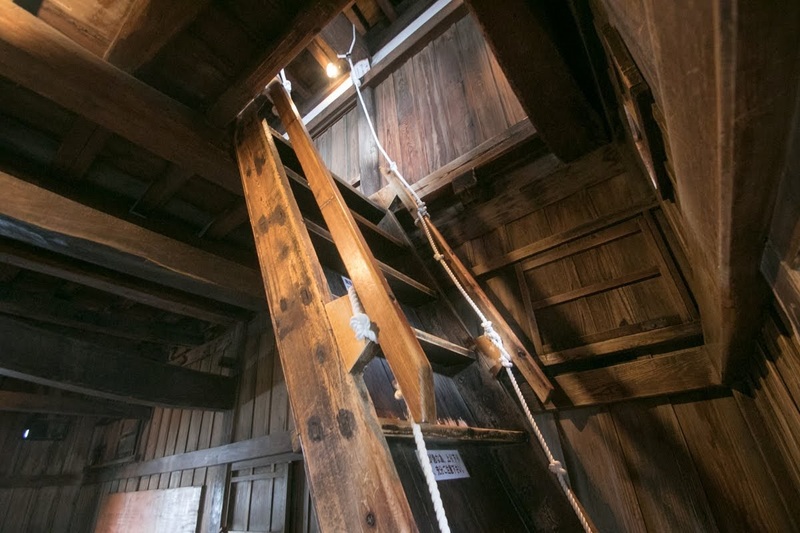 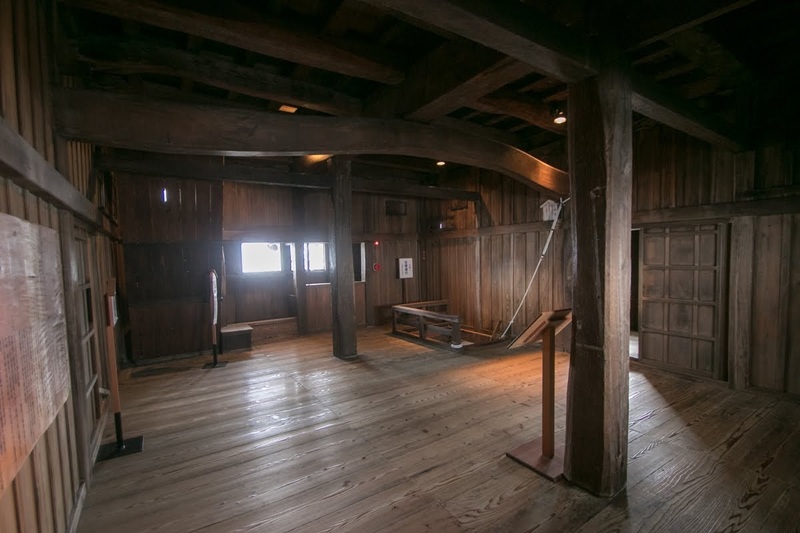 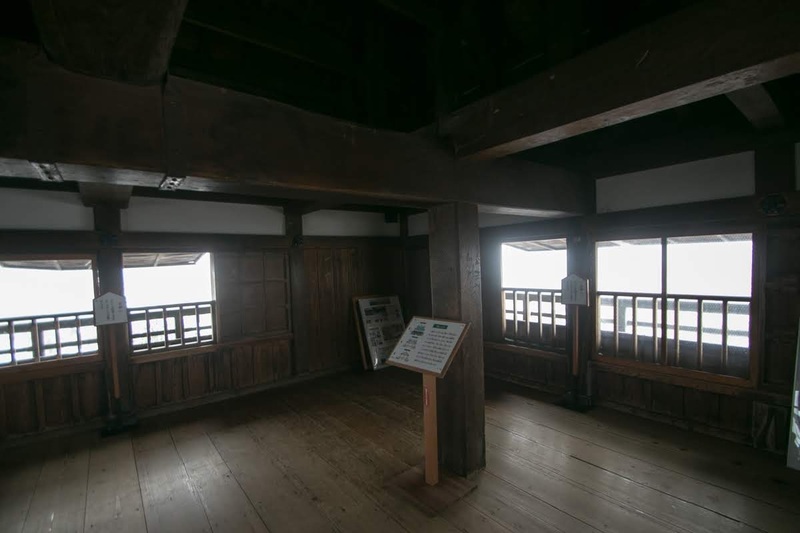 This main tower is a three story three floor tower without basement floor, and a simple one covered by brown wood board. 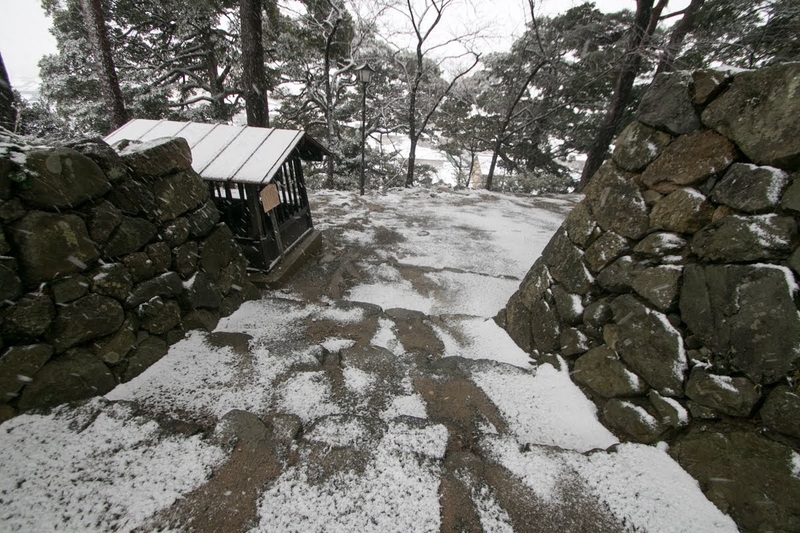 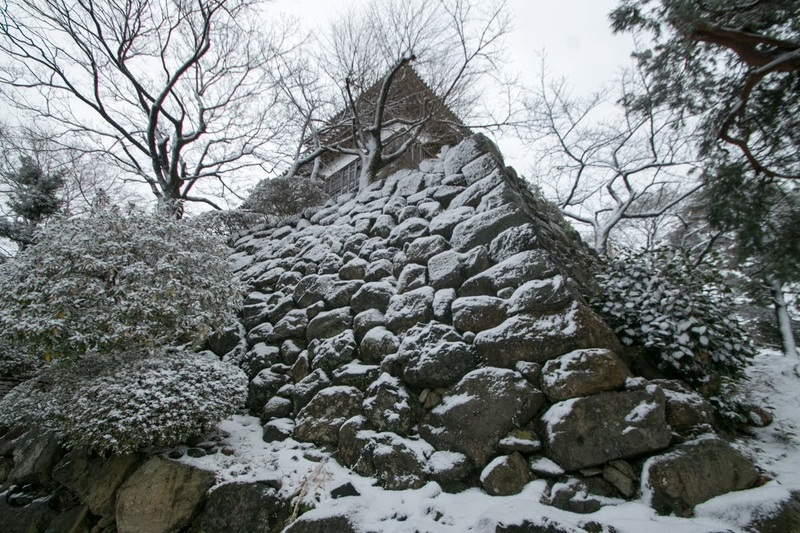 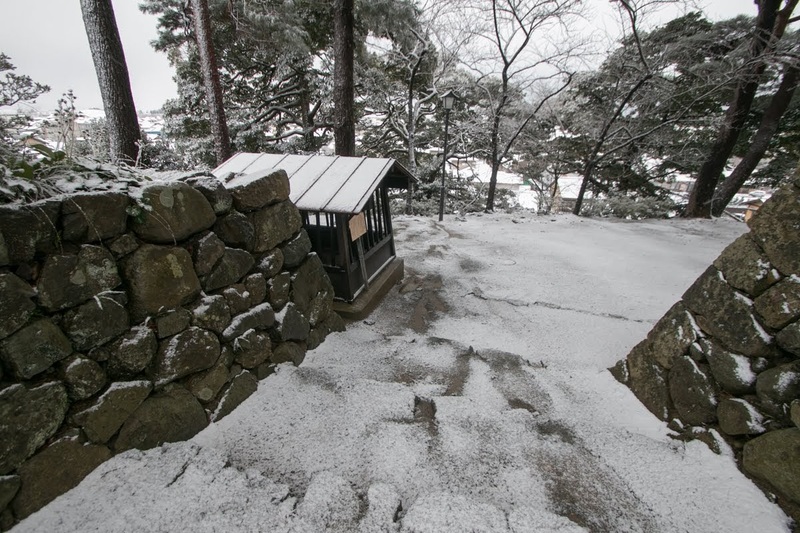 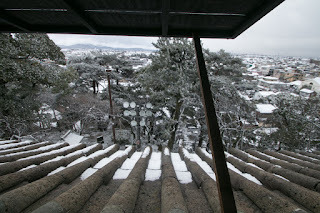 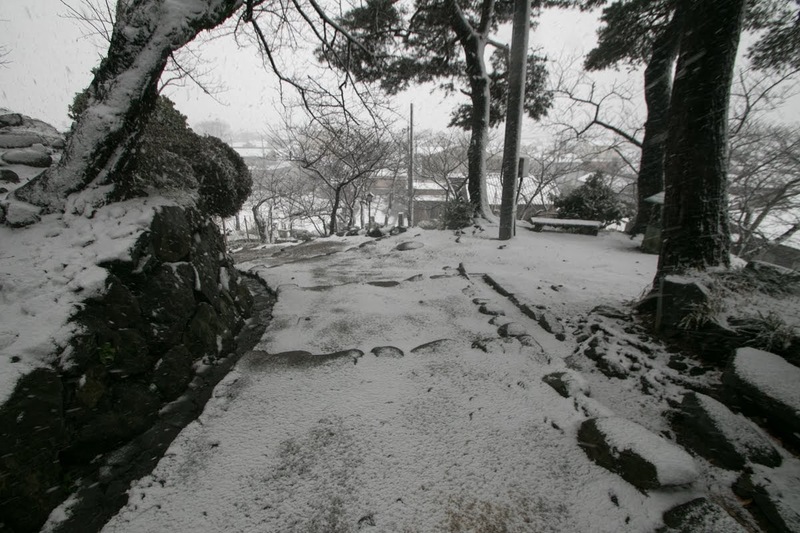 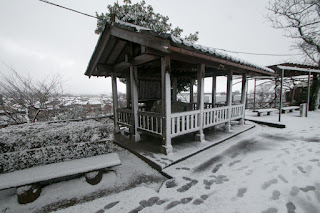 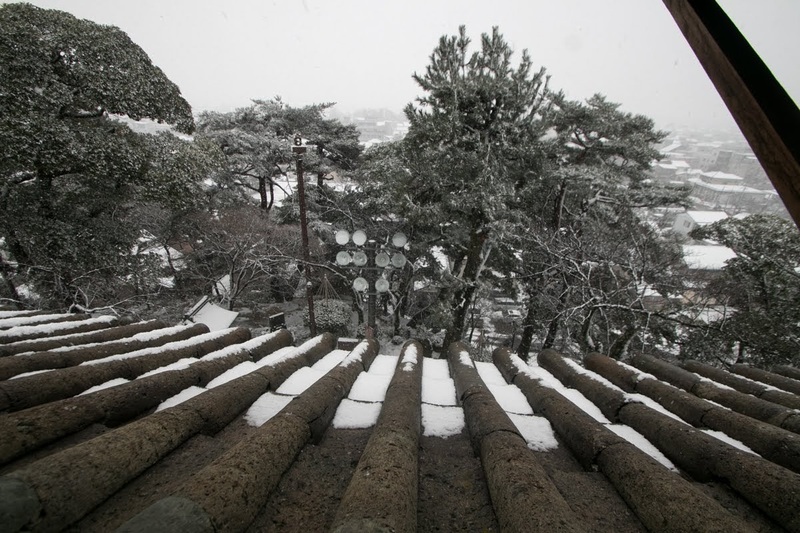 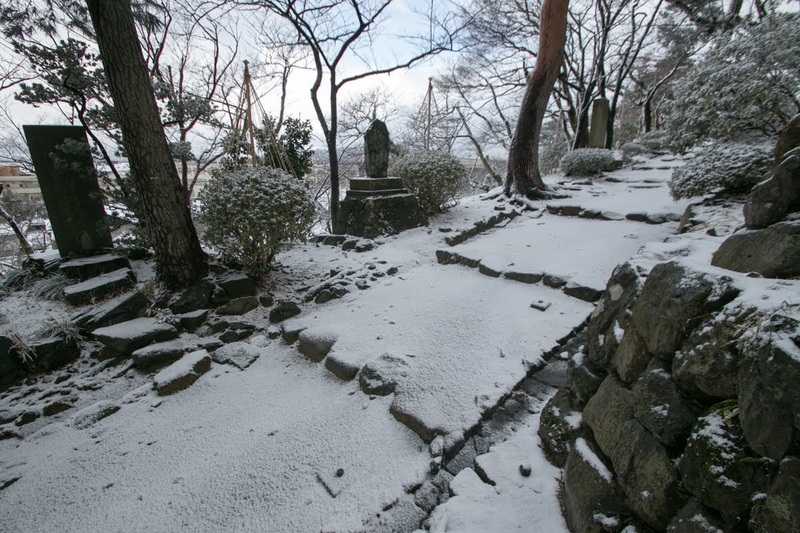 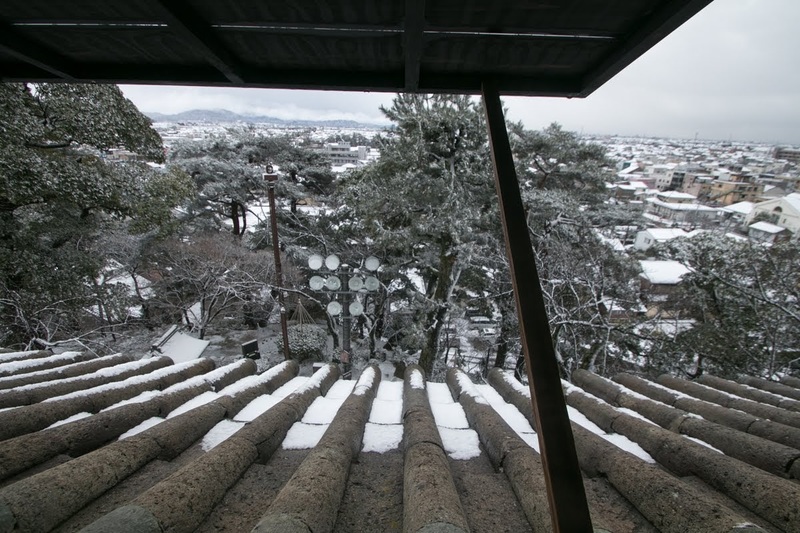 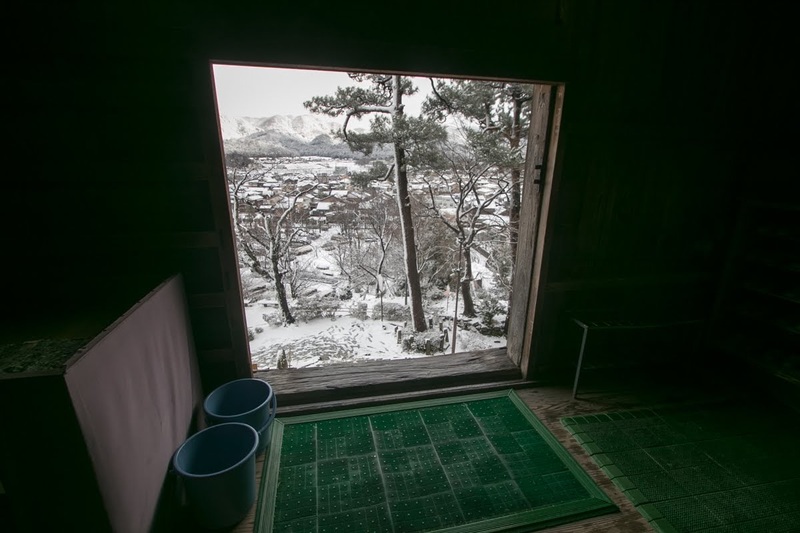 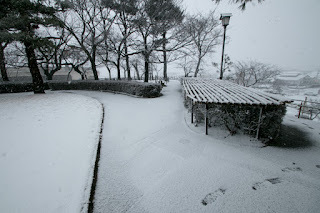 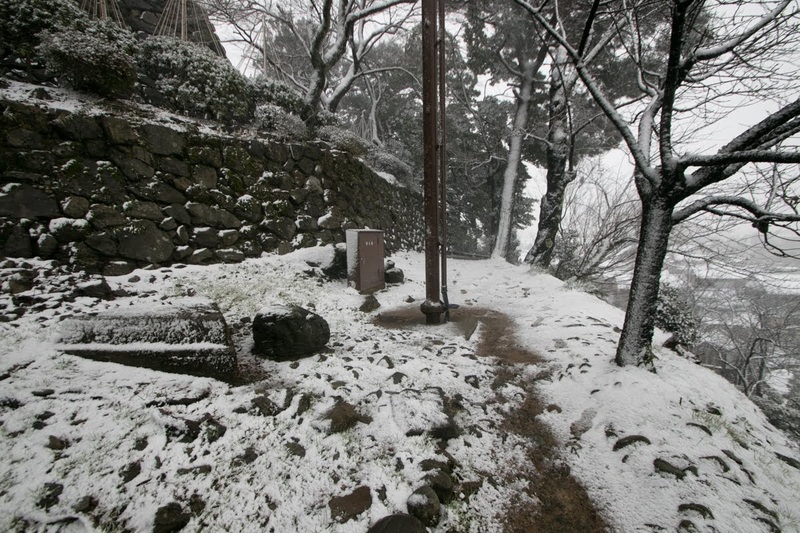 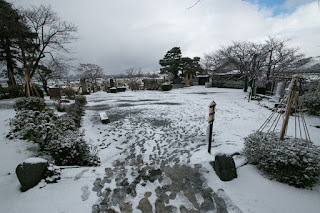 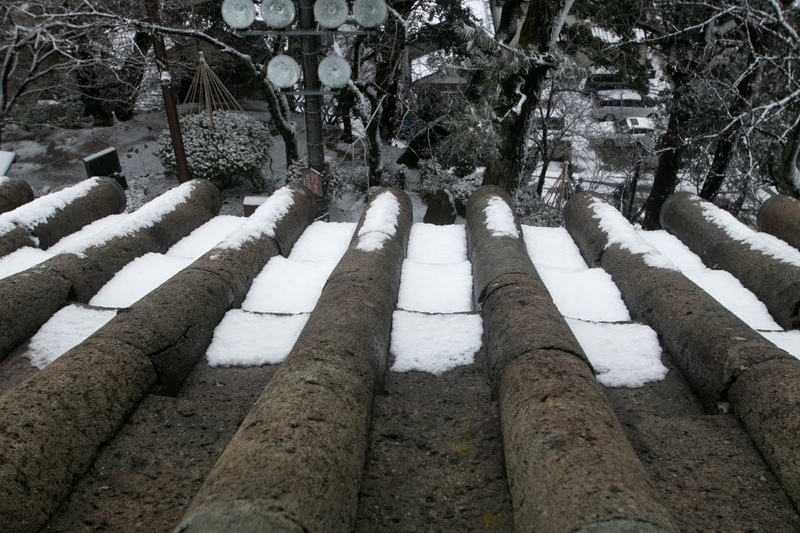 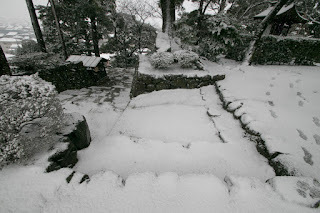 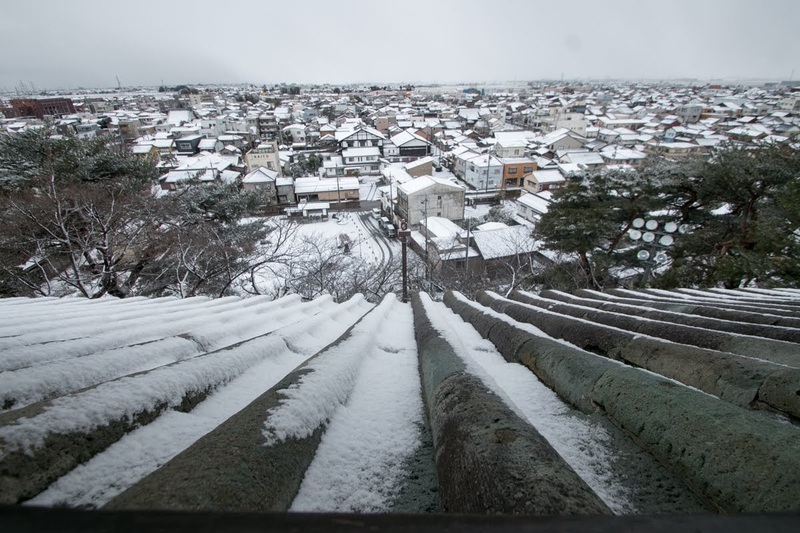 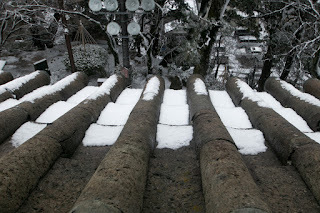 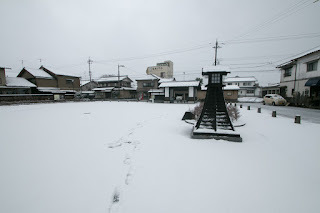 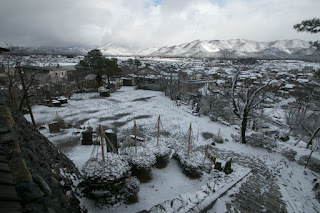 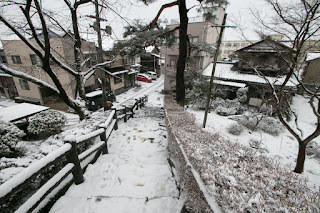 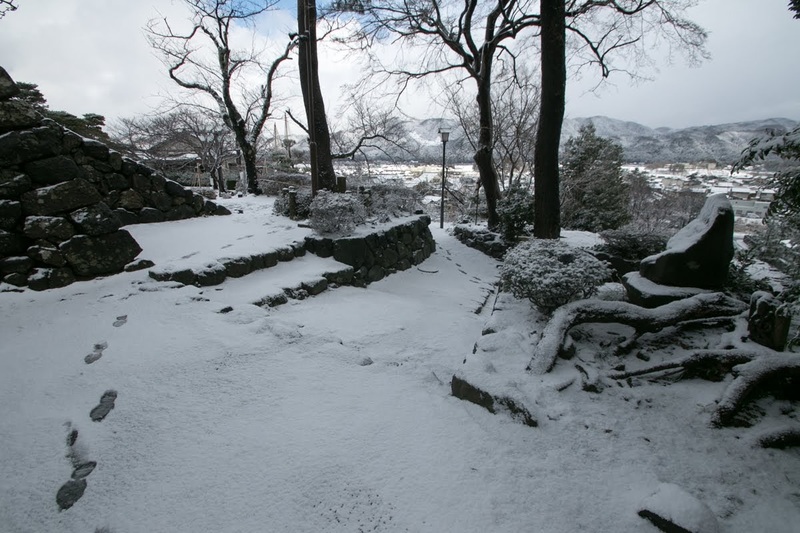 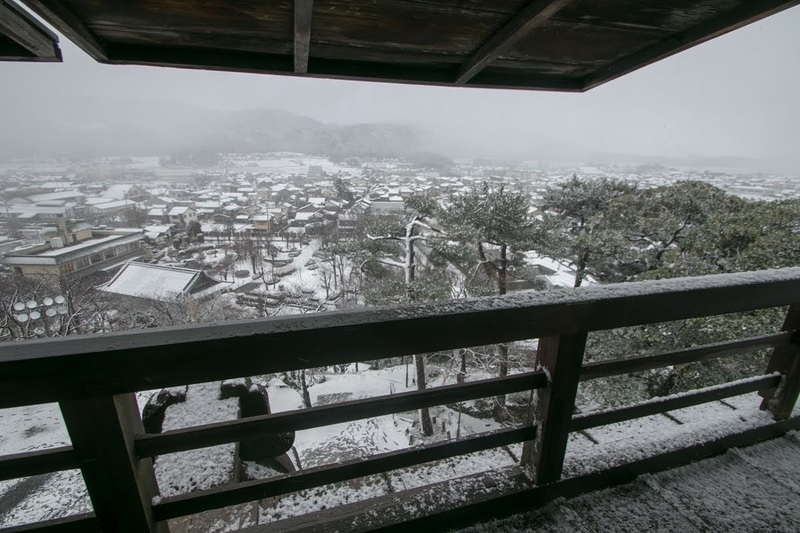 The roof is covered by stone roofing blocks, as popular ceramic roofing stones would be broken by cold weather and snows. 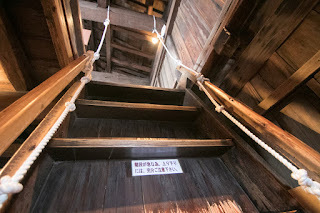 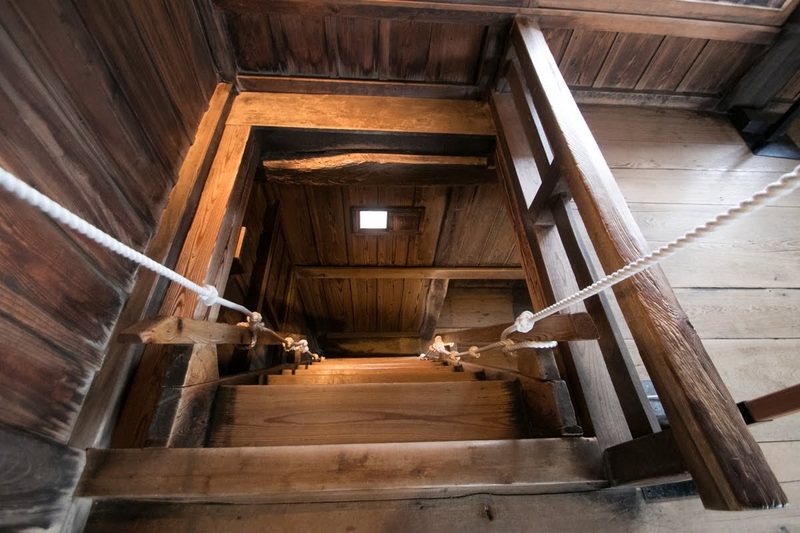 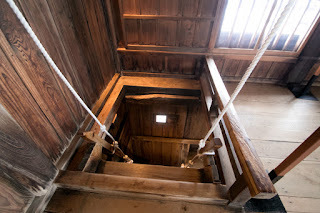 Interior of the tower is also quite simple, and each floor is connected by quite steep (dangerous without gripping guide ropes). The shape of main tower is Boro-style (watchtower style) which consist two floor basement with large gable roof and one watch tower placed over the basement. 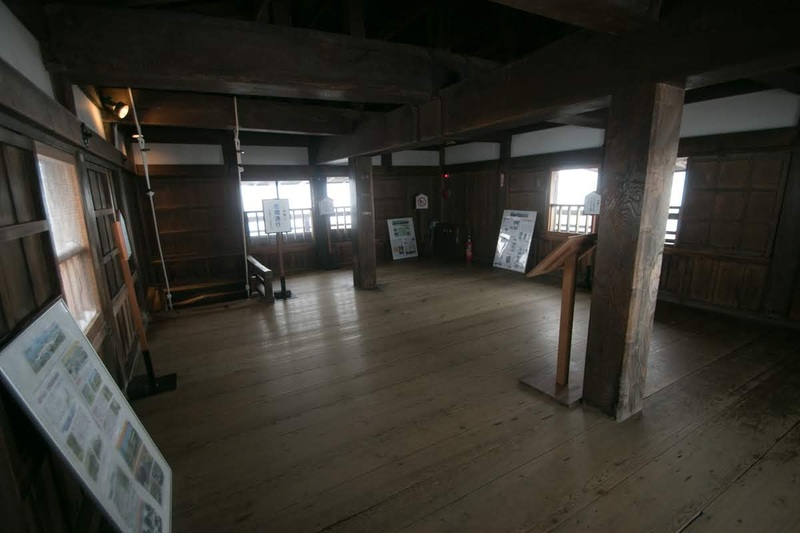 As being built in old style, this main tower is sometimes said as the oldest original main tower remaining in Japan. 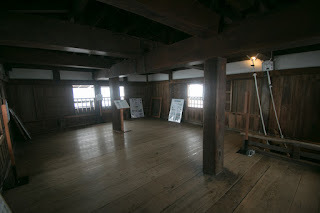 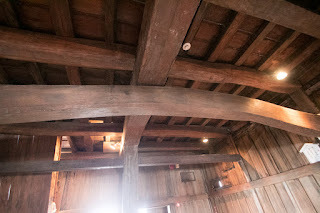 Among 12 remaining main towers, main tower of Inuyama castle, Matsumoto castle and Maruoka castle belong to old group built around 1600, but precise order is unknown because there was no detailed record of building such as middle or late part of Edo period, and some towers were build by extension of existing building. 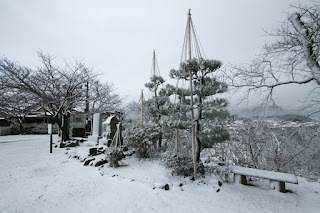 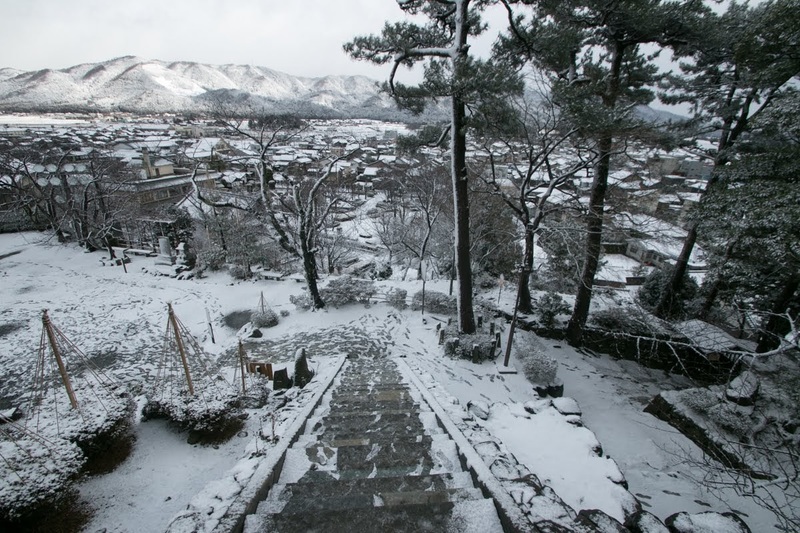 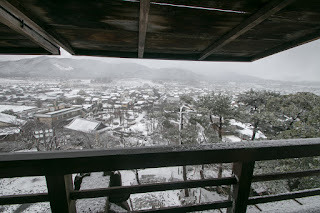 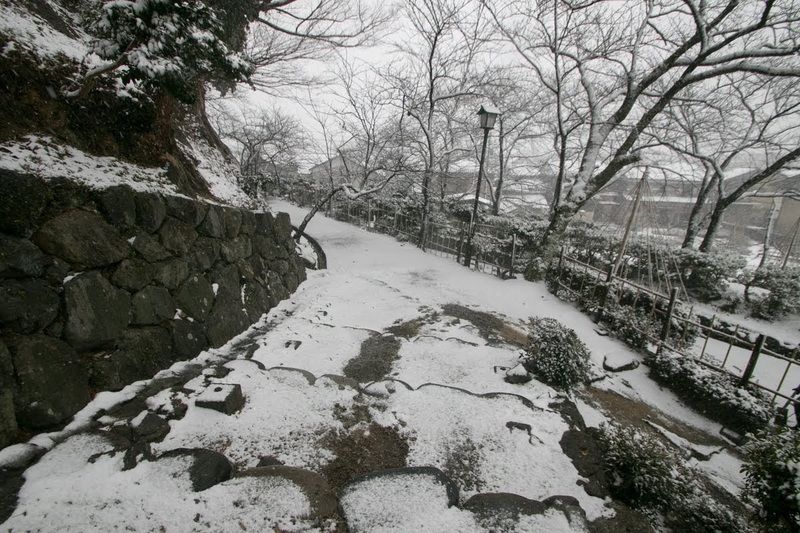 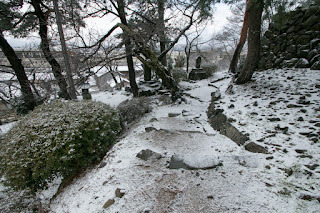 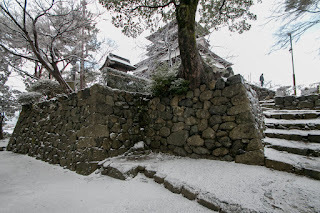 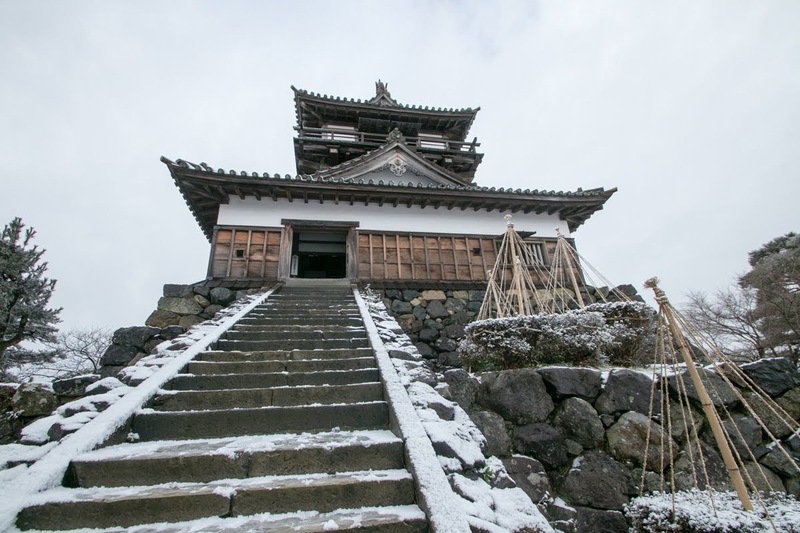 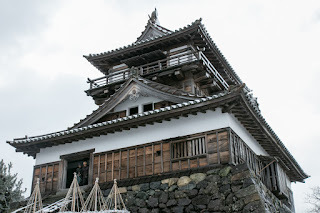 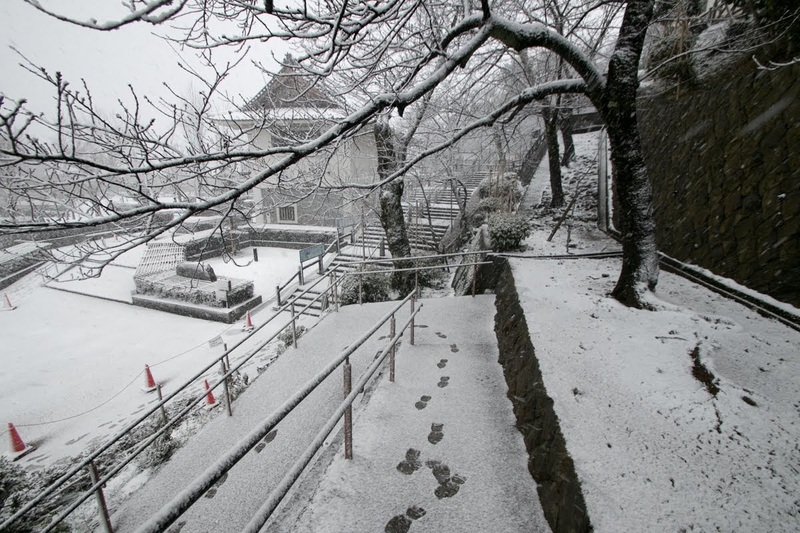 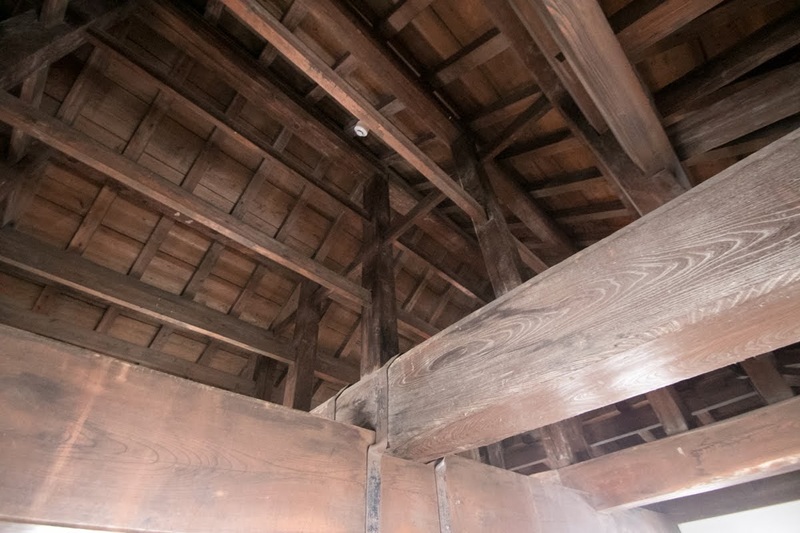 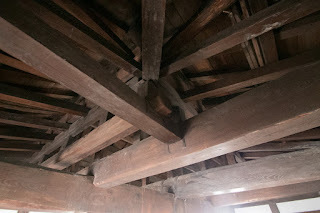 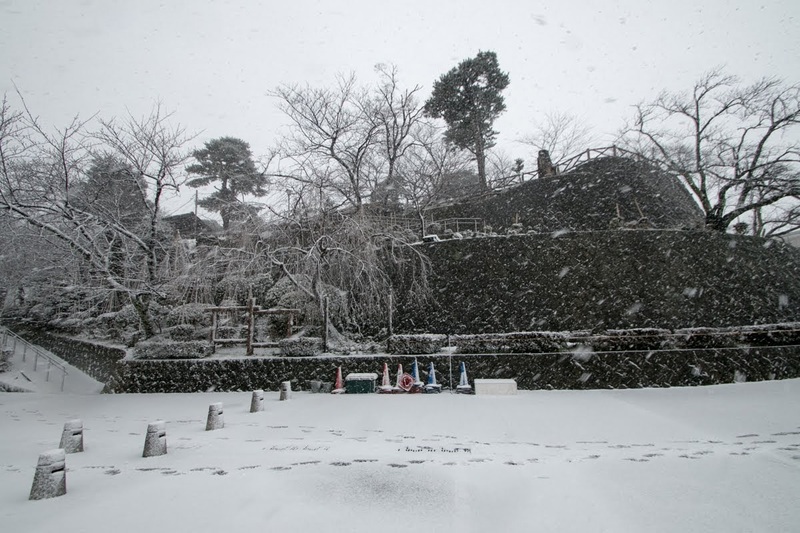 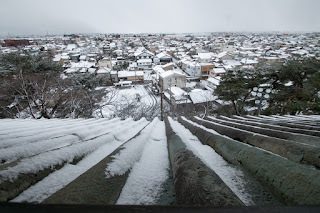 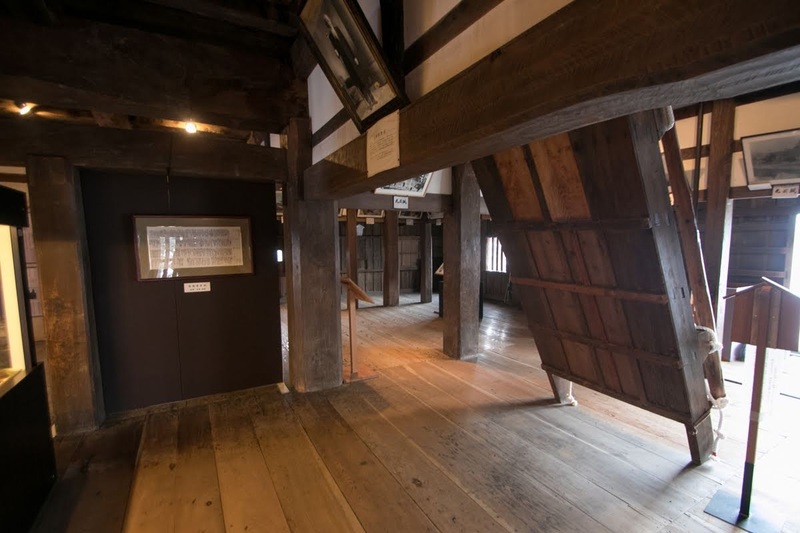 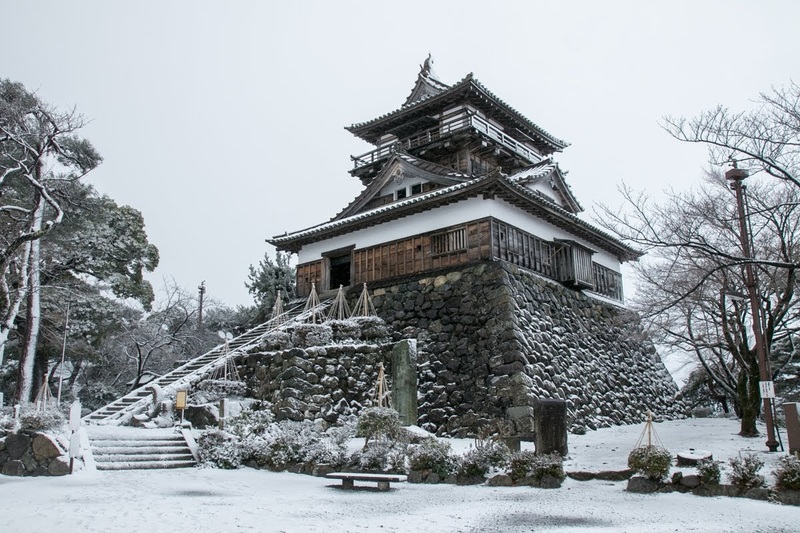 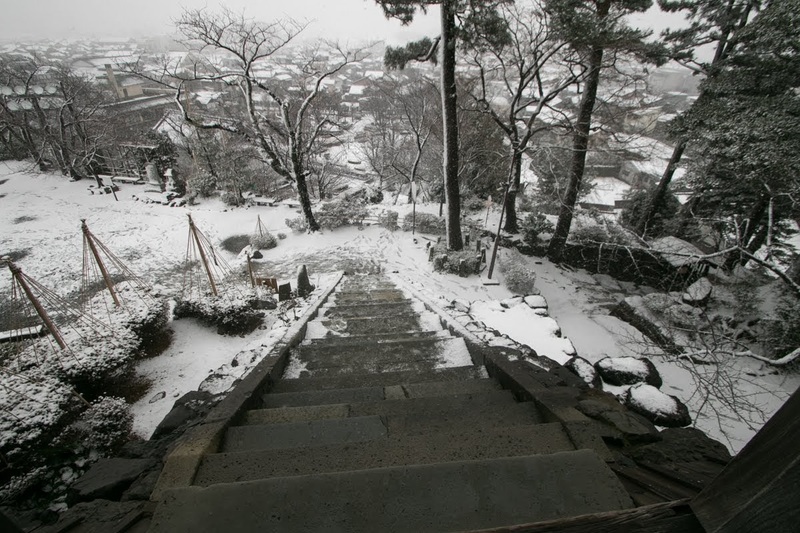 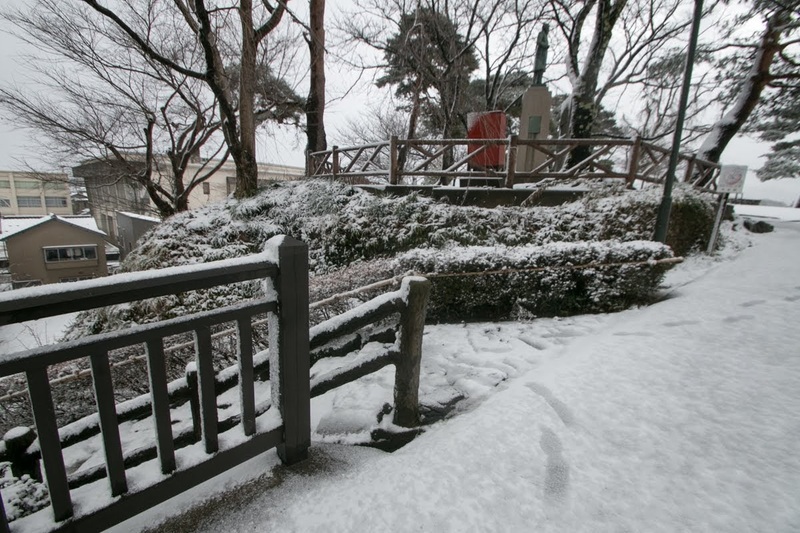 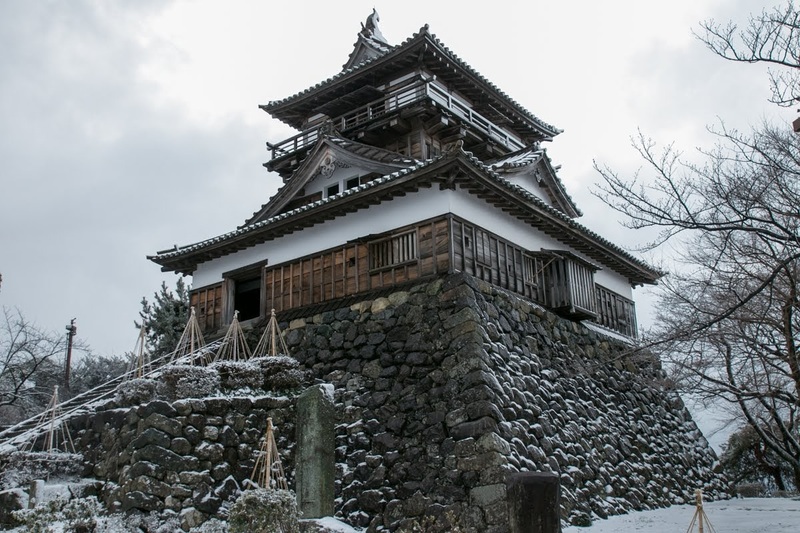 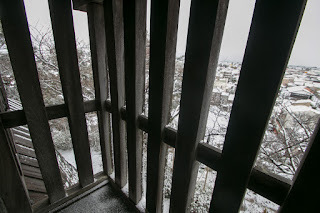 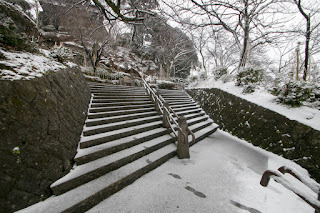 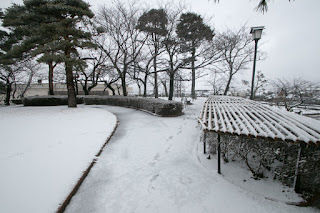 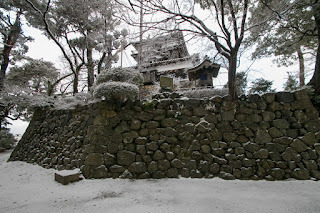 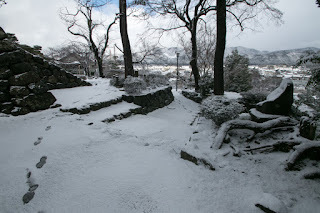 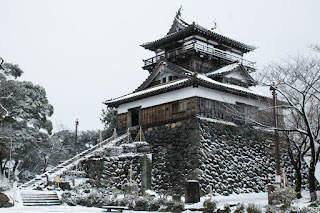 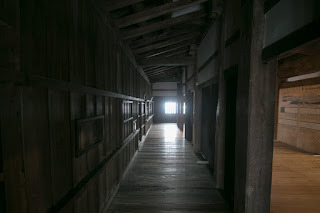 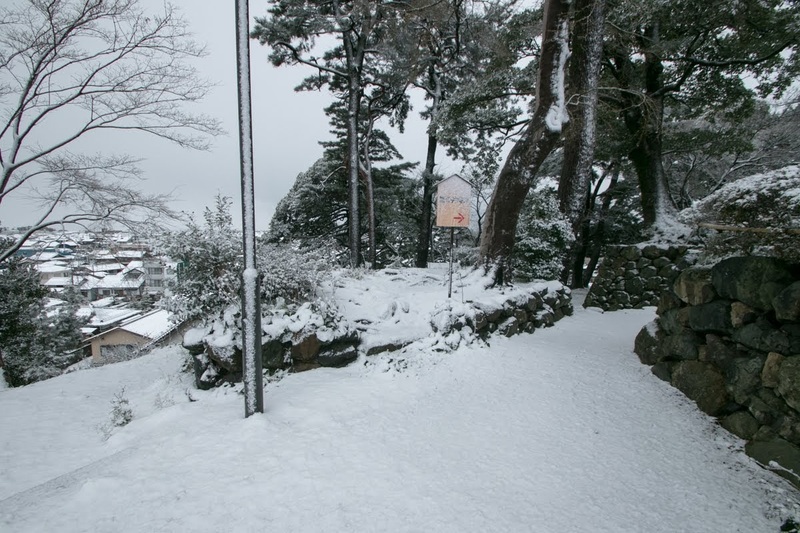 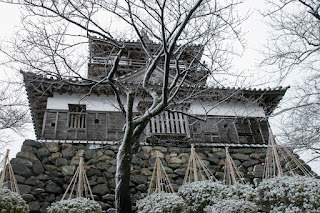 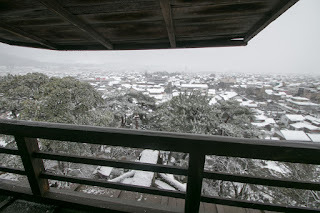 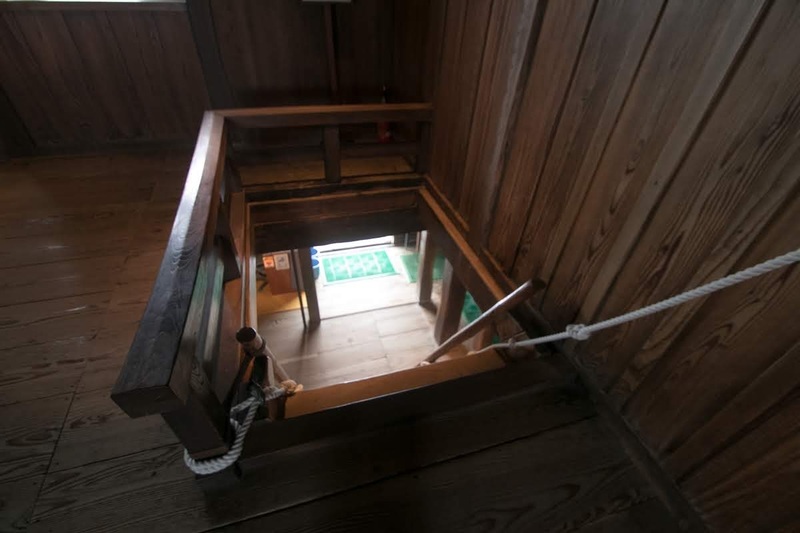 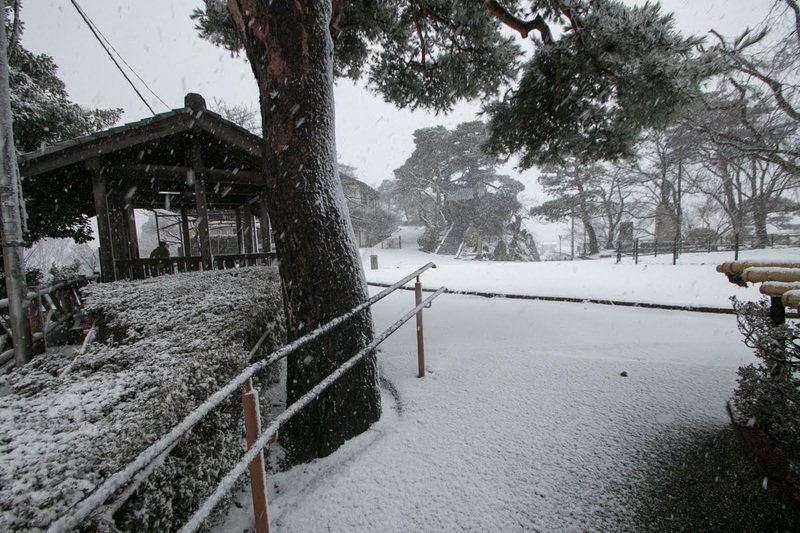 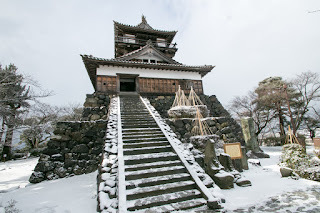 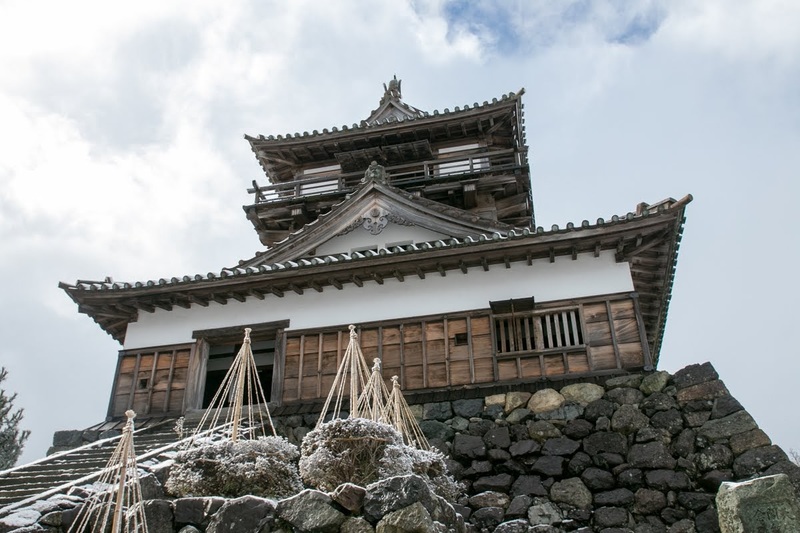 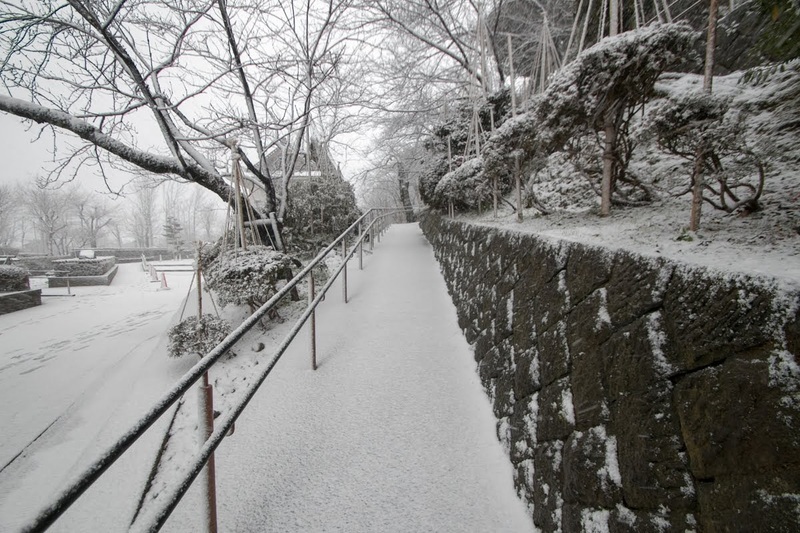 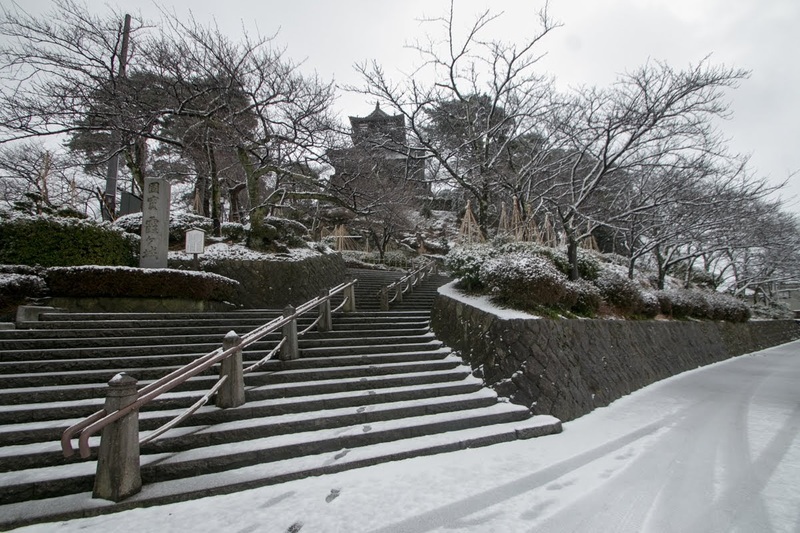 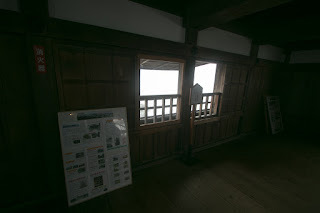 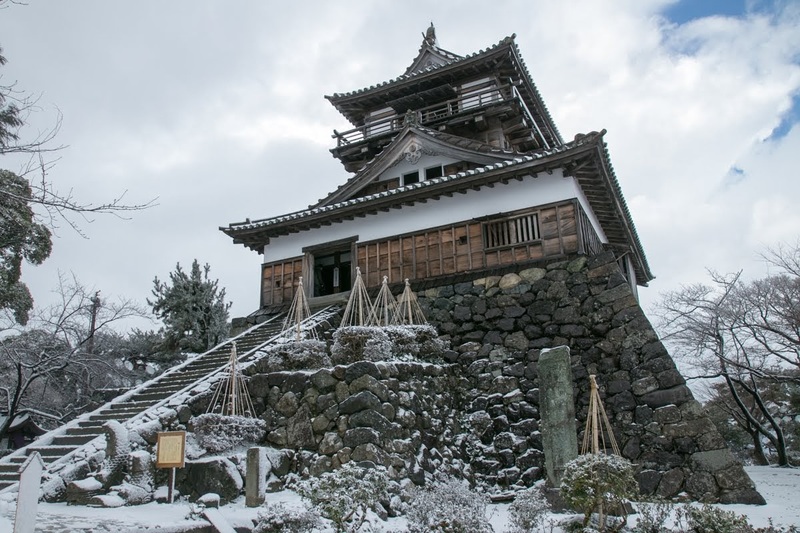 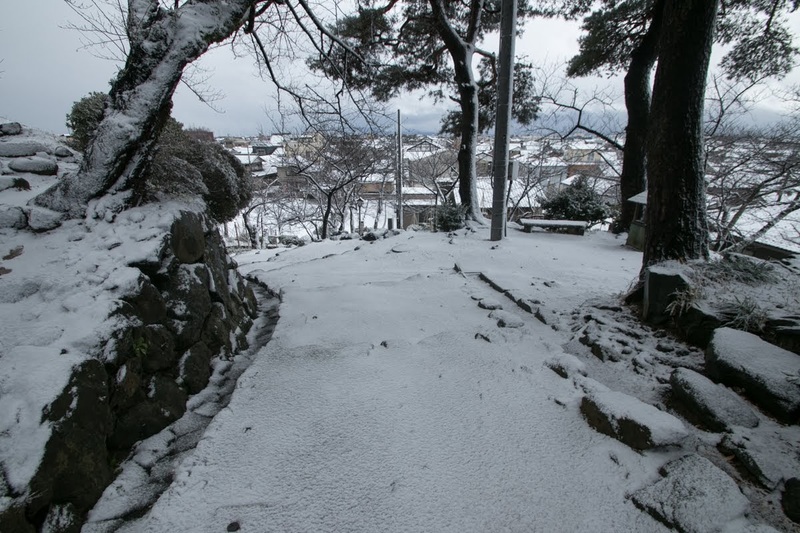 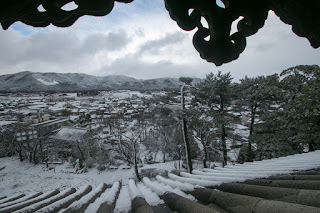 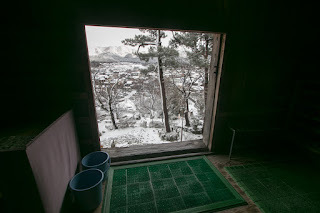 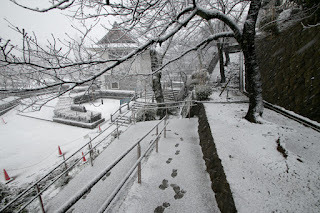 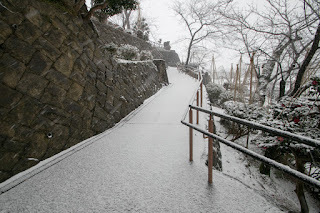 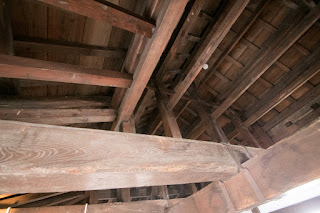 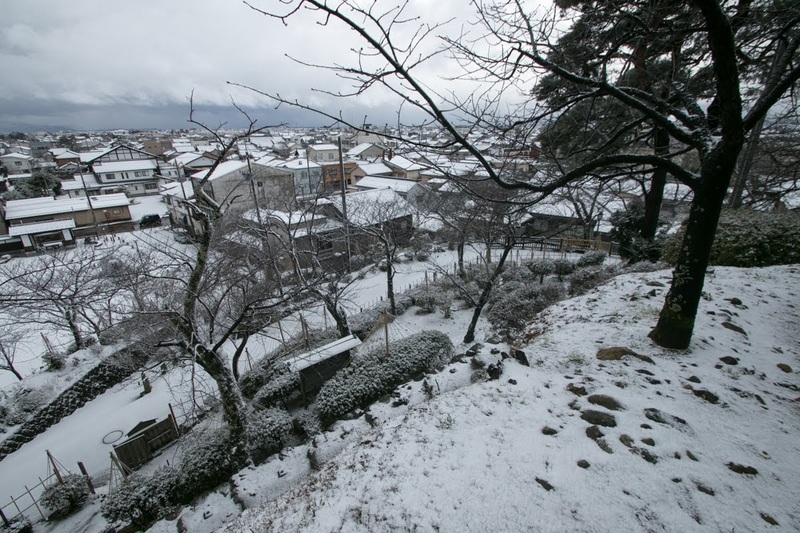 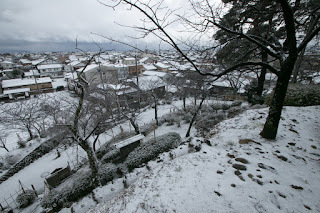 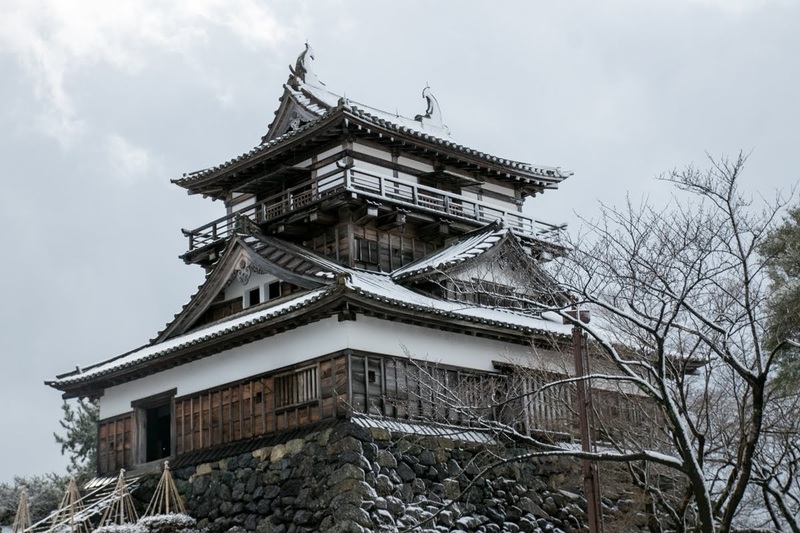 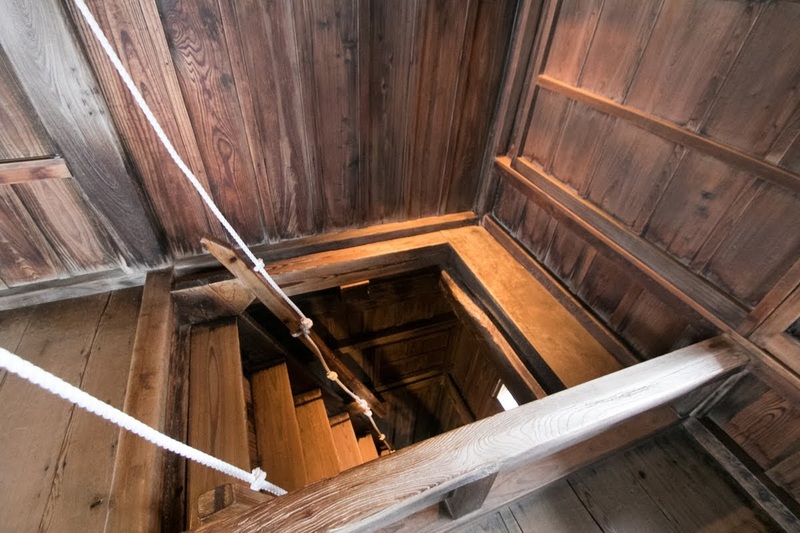 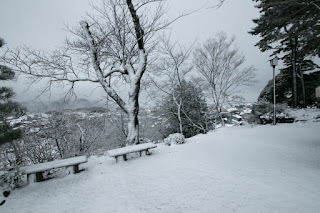 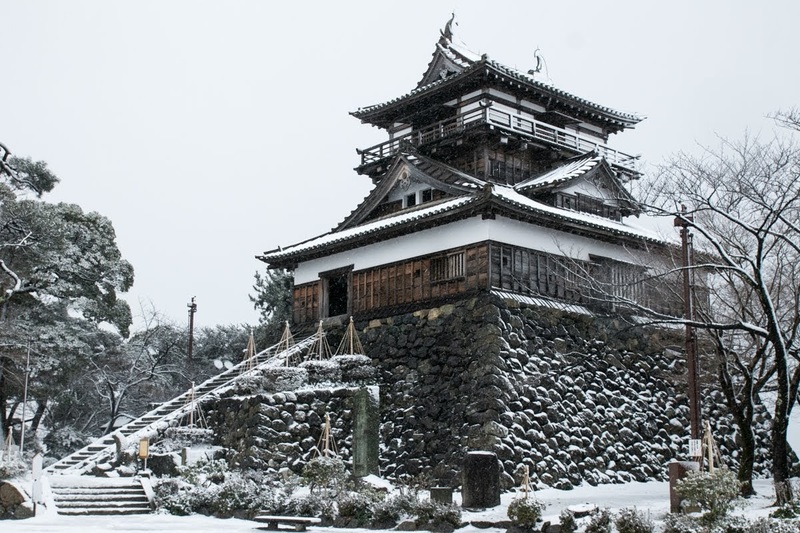 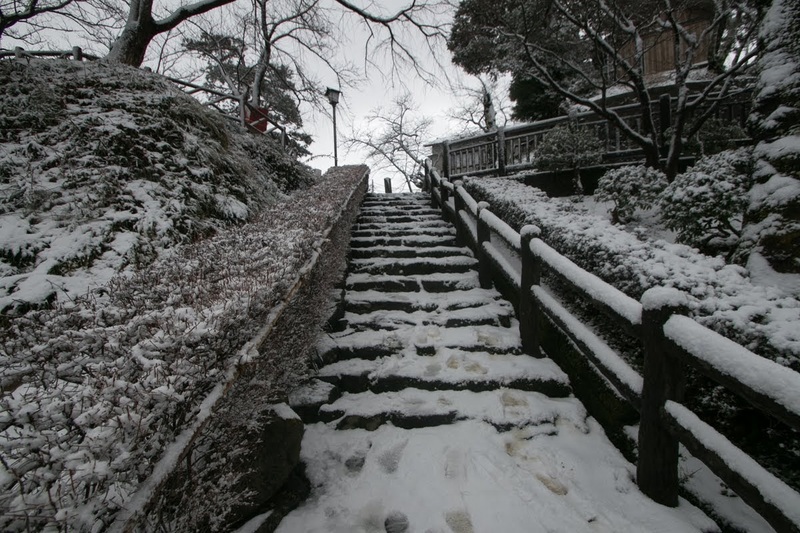 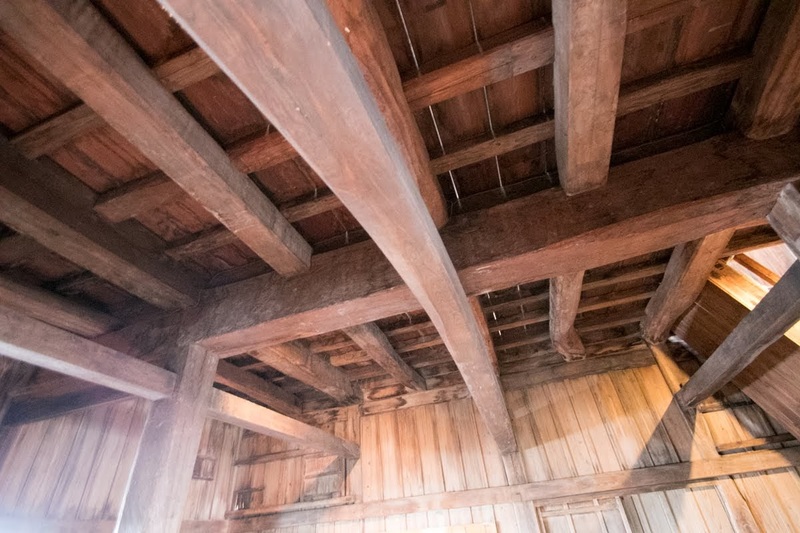 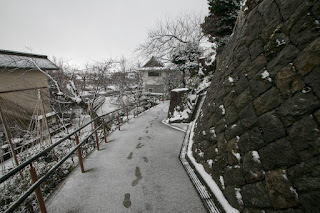 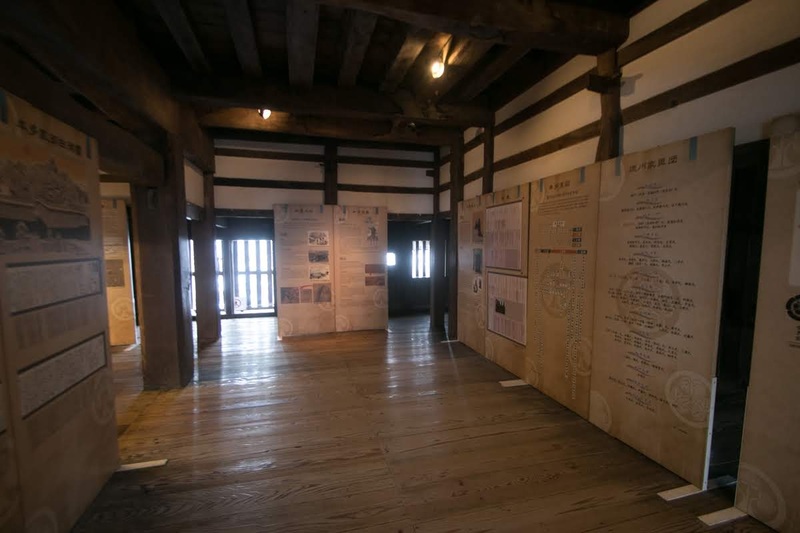 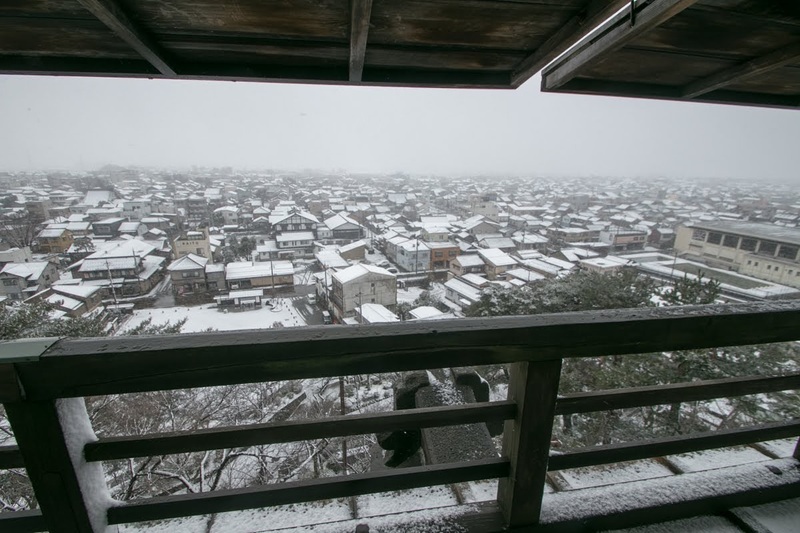 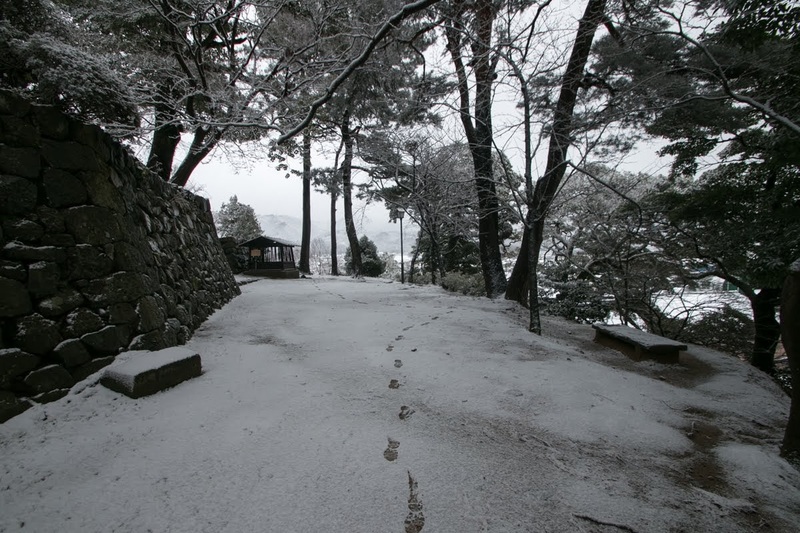 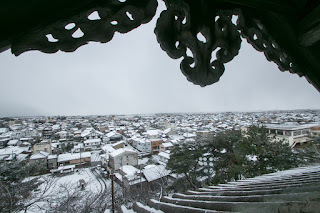 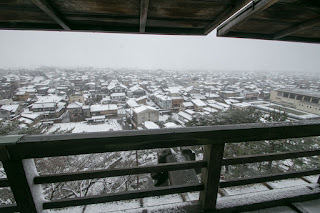 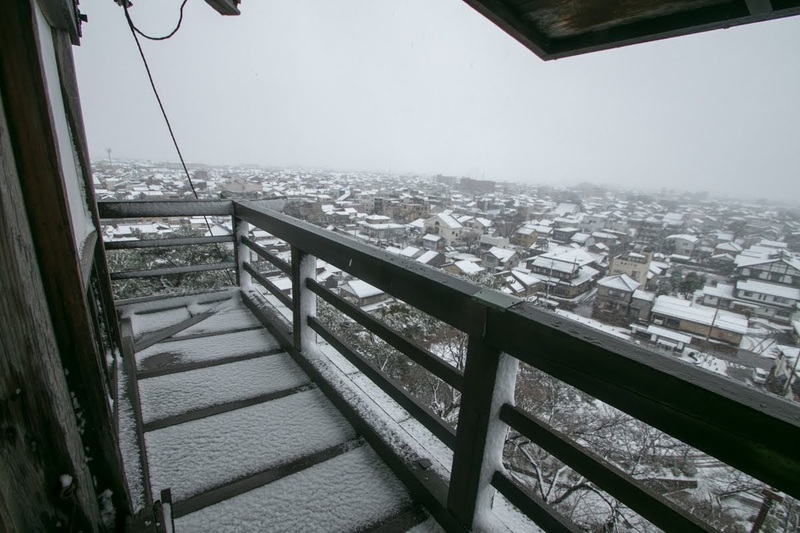 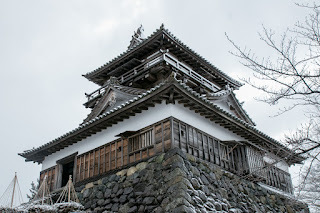 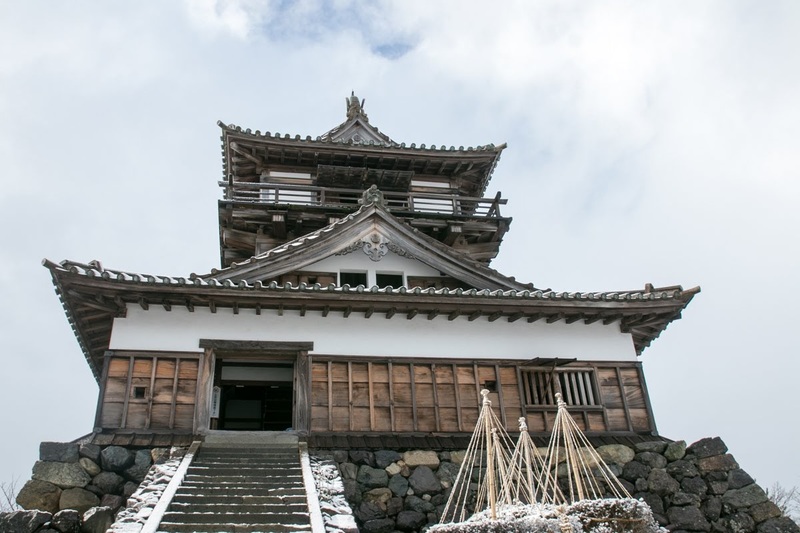 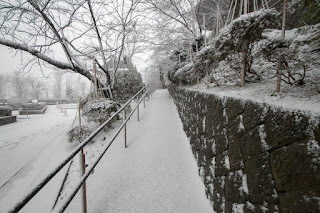 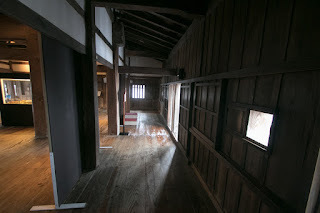 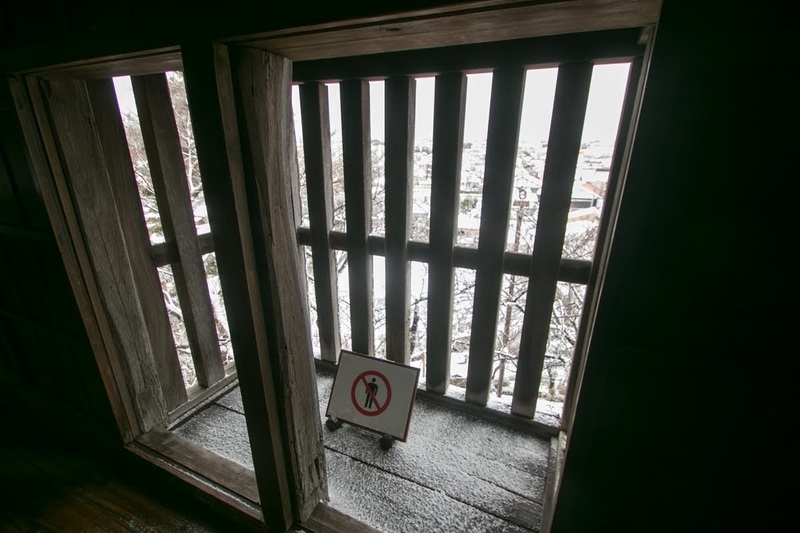 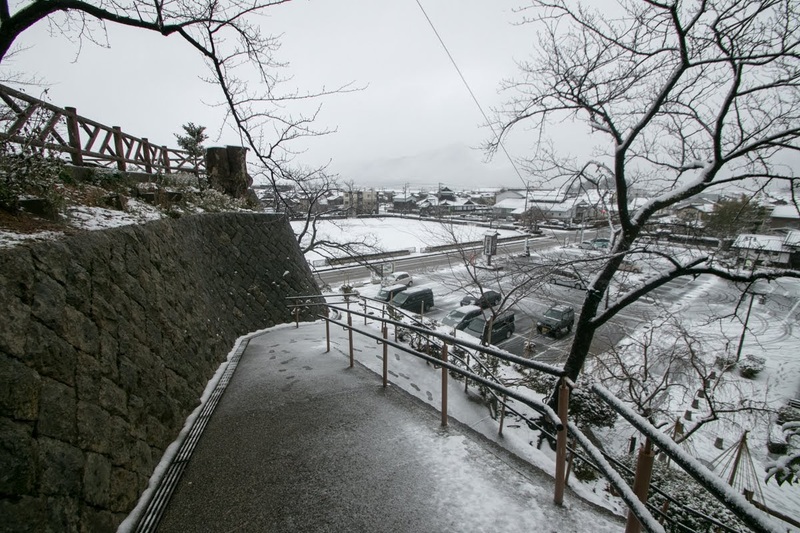 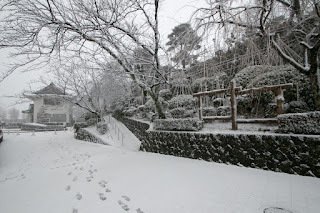 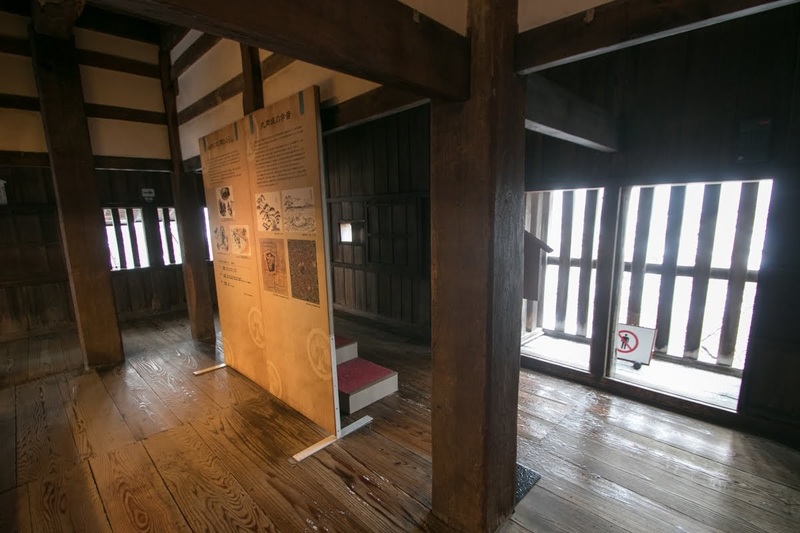 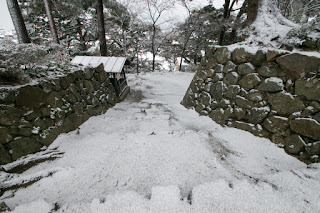 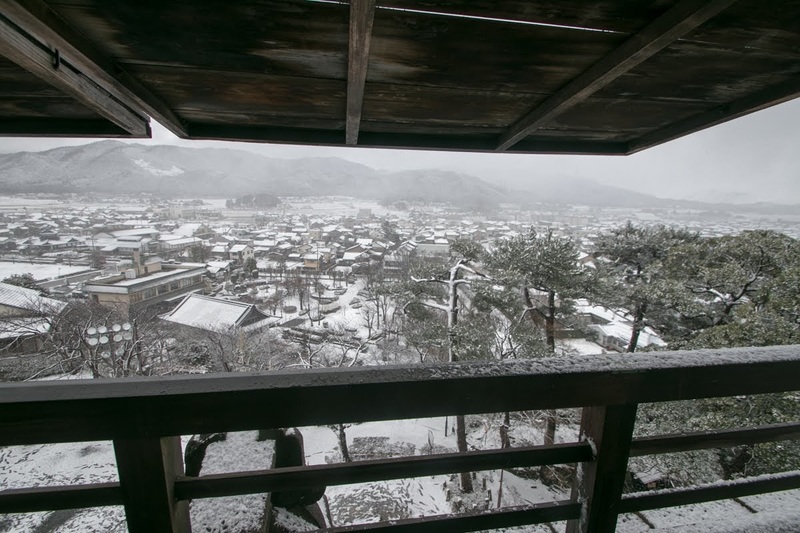 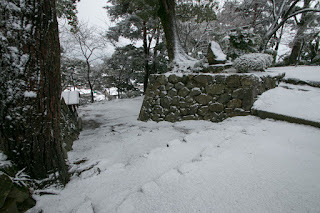 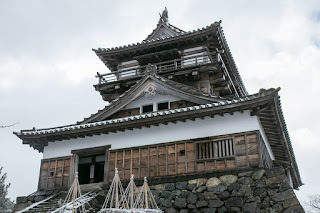 Regarding Maruoka castle, the castle itself was built in 1576, but as webmaster’s personal view, main tower of Maruoka castle was built around 1600 or after, probably little after the one of Matsumoto castle. 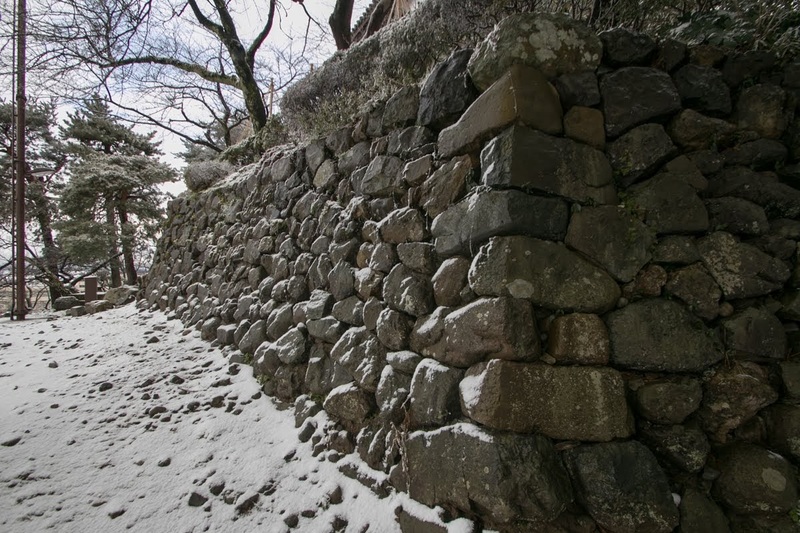 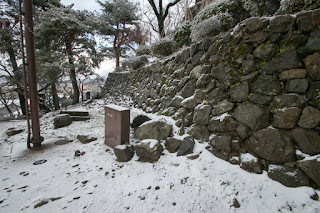 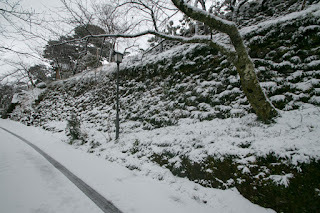 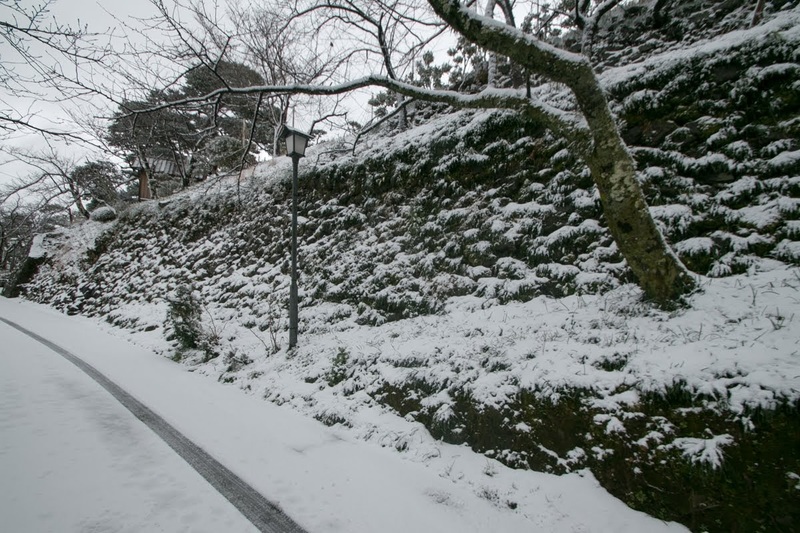 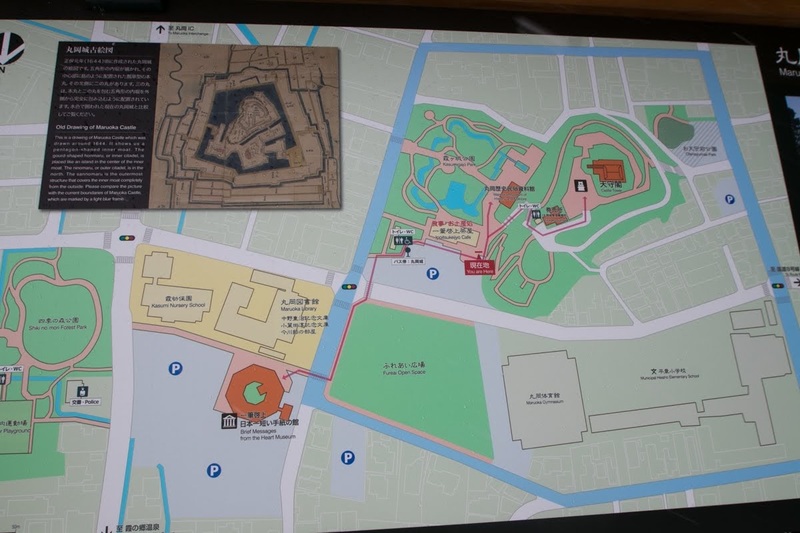 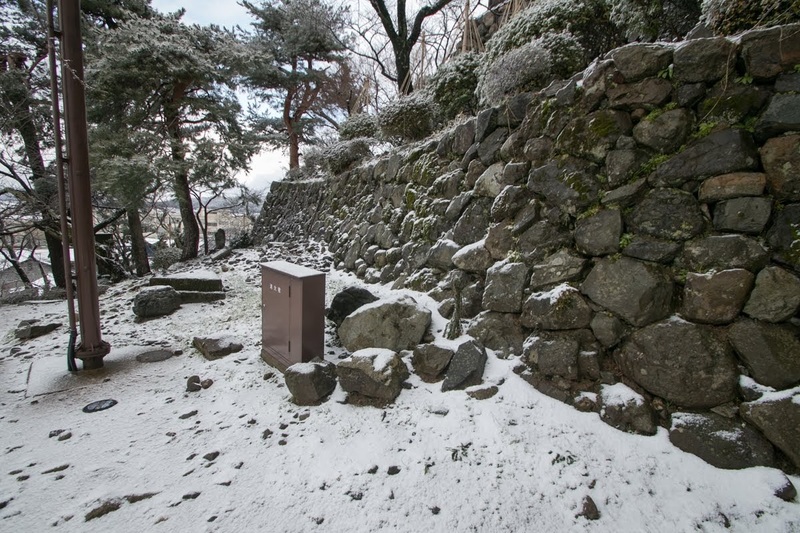 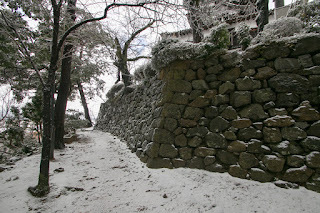 Stone wall of basement looks more improved than other stone walls of central area originally built, and old generation main towers were usually built at the edge of central area as a part of defense facility, but the one of Maruoka castle stands at the center of central area. In any case, this tower belongs to the oldest group of remaining main towers and has high value. 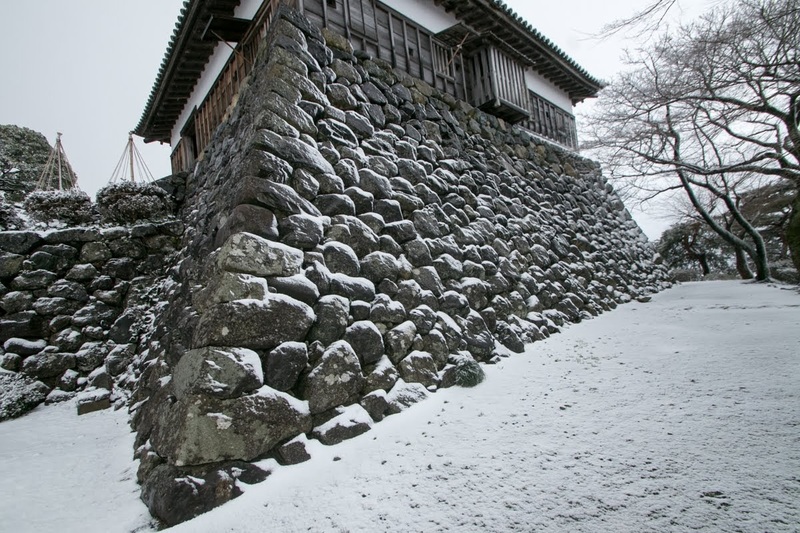 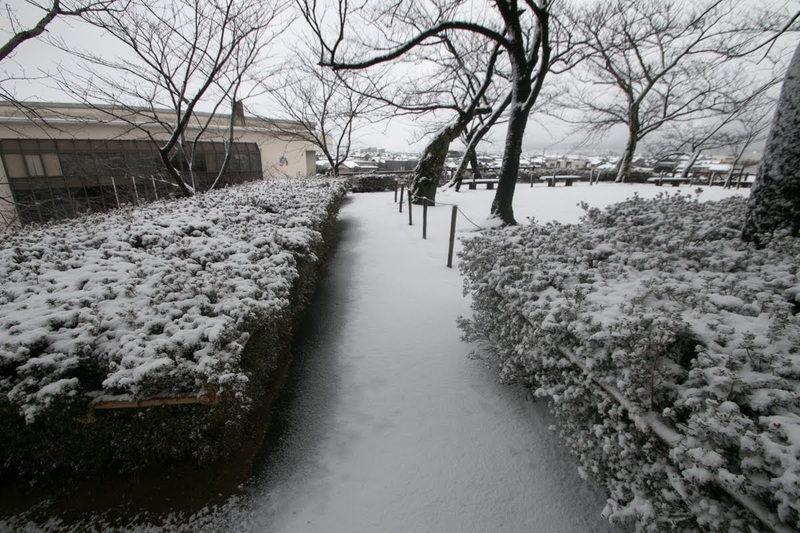 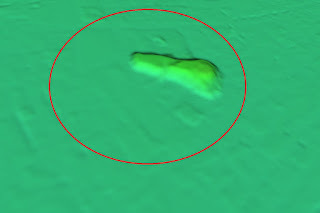 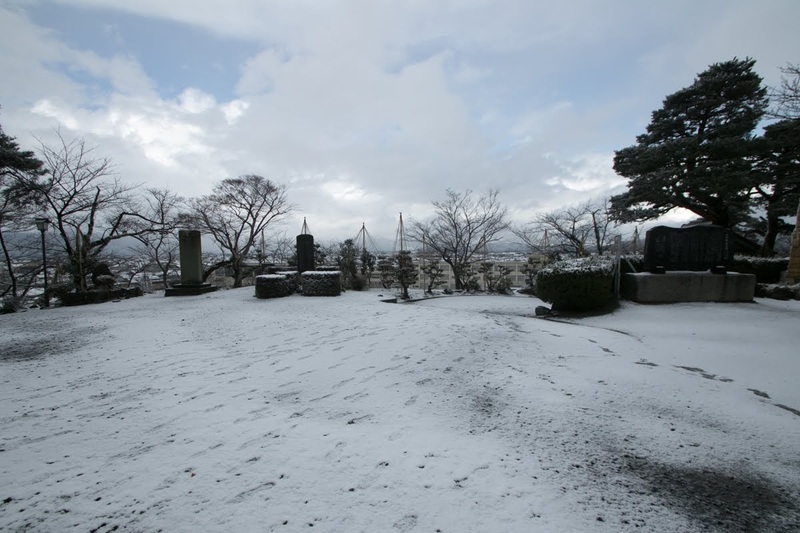 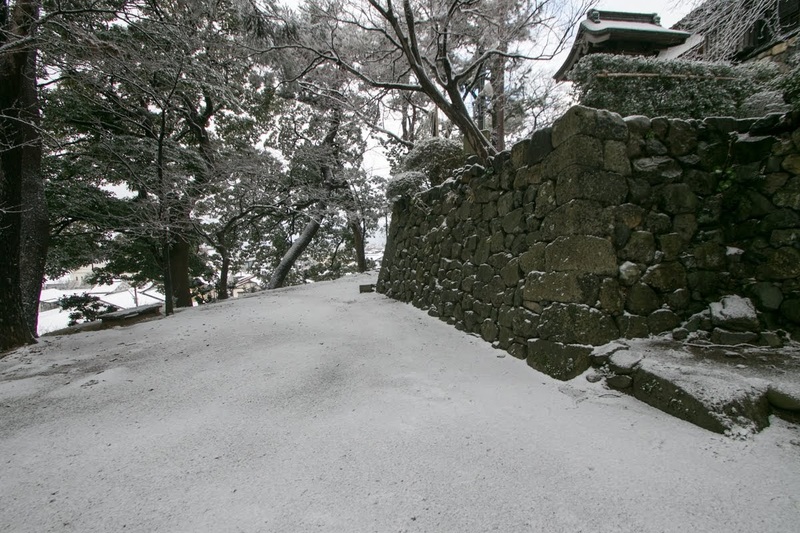 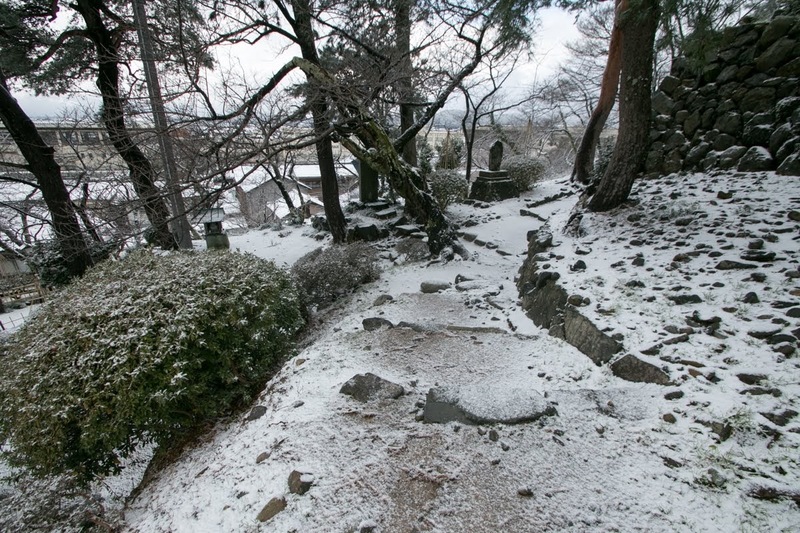 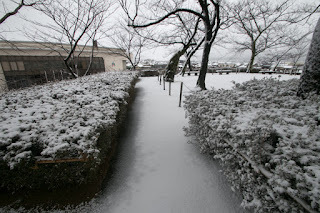 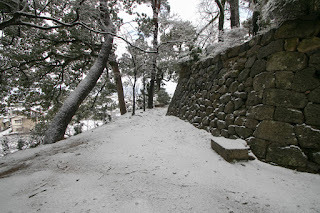 After Honda clan, hereditary retainer of Edo shogunate served as a commander of this castle throughout Edo era. Subsequent to Meiji revolution, most buildings were broken and water moats were reclaimed, but only main tower remained as facility of local government. After WW2, the main tower once collapsed by Fukui Great Earthquake in 1948, but later rebuilt using original materials in 1955. 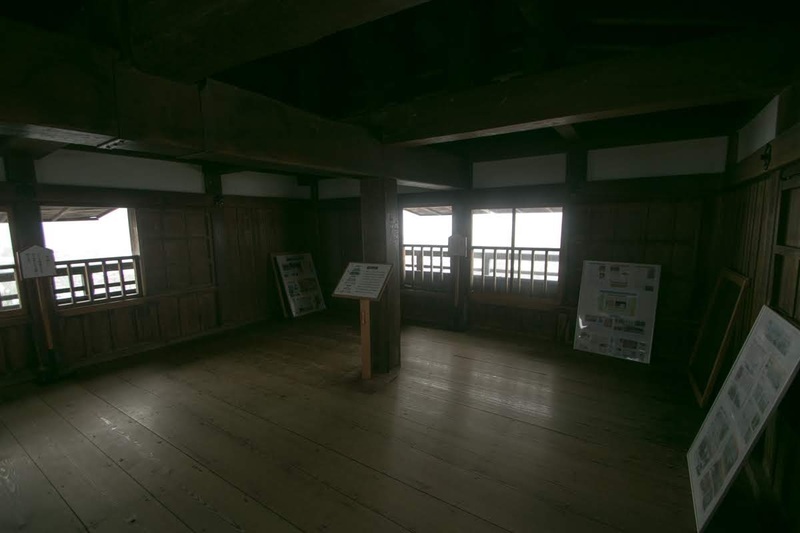 Today small but fascinating brown tower stand at the hill looking town the town, and the site of castle became a famous site of cherry blossom. 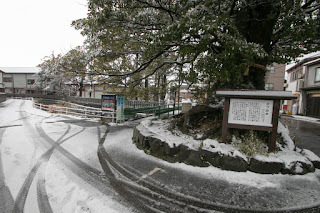 Bus or taxi from JR West Hokuriku-Honsen line Maruoka station. Bus from JR West Fukui station to Honmauoka bus terminal is also available. 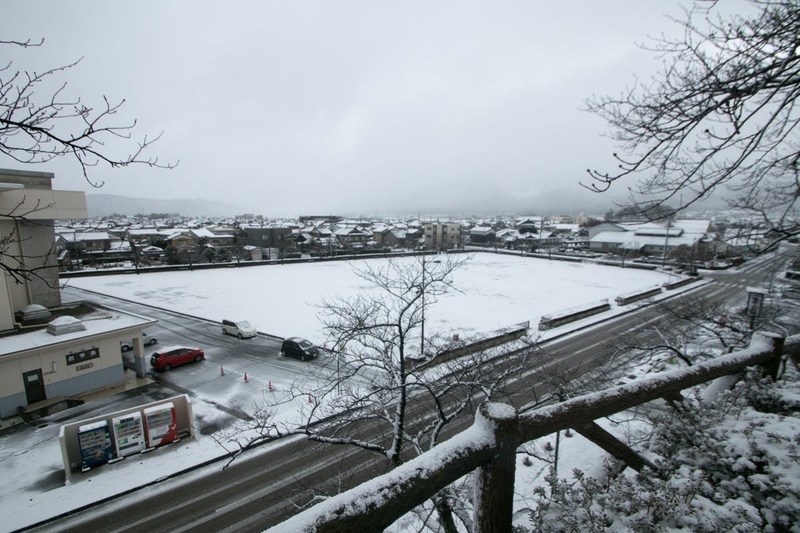 10 minutes drive from Hokuriku Jidoshado Expressway Maruoka interchange.